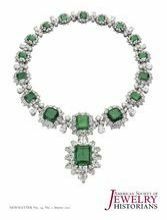 I was born in Rome and for as long as I can remember I have always been fascinated by jewels, something that was certainly of no interest to my immediate family. 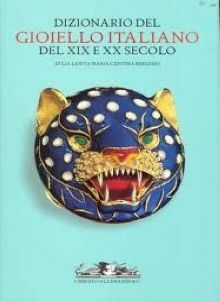 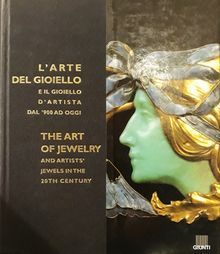 I graduated from Cambridge University with a thesis, not surprisingly, on jewels depicted in paintings in Florence during the Early Renaissance. 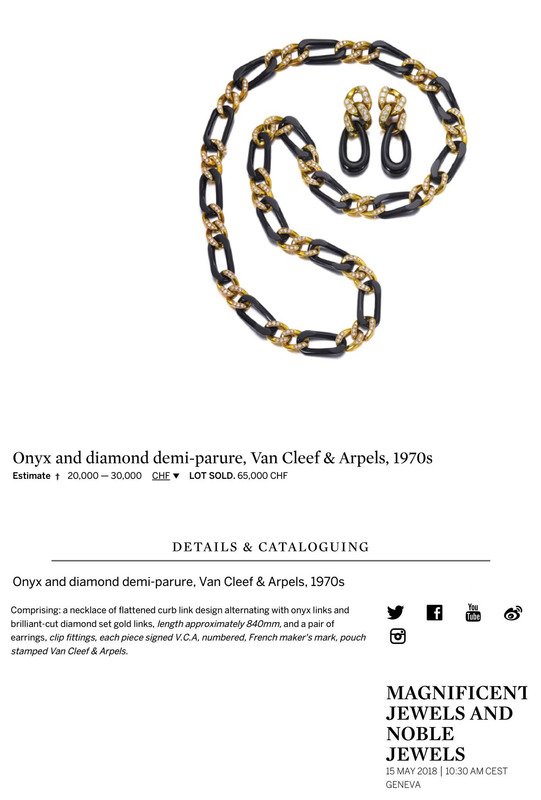 My search for employment led me to the best possible place to see, touch and get to know the greatest number and diversity of quality jewels: an auction house. 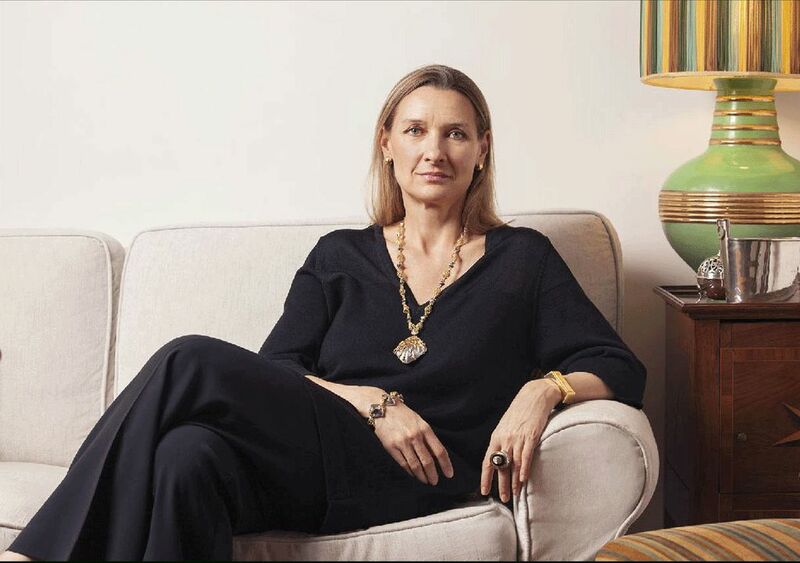 I spent 14 years at Sotheby's: initially in London starting with making photocopies and tea, then I progressed to cataloguing in Geneva, and finally I became an expert, appraiser, an auctioneer and head of the jewellery department in Amsterdam. 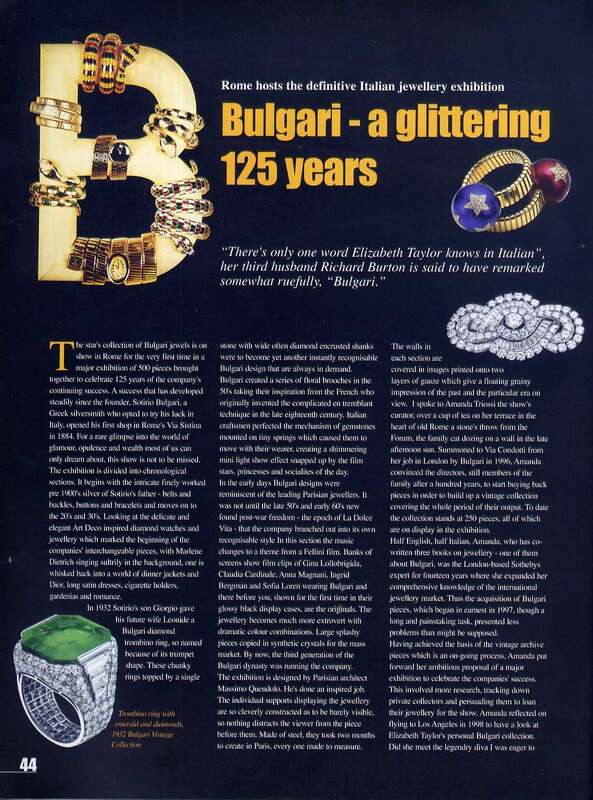 In 1997 I began a 18 year collaboration with Bulgari, forming the company's historical archives and creating Bulgari's permanent retrospective collection of jewels, watches and precious objects. 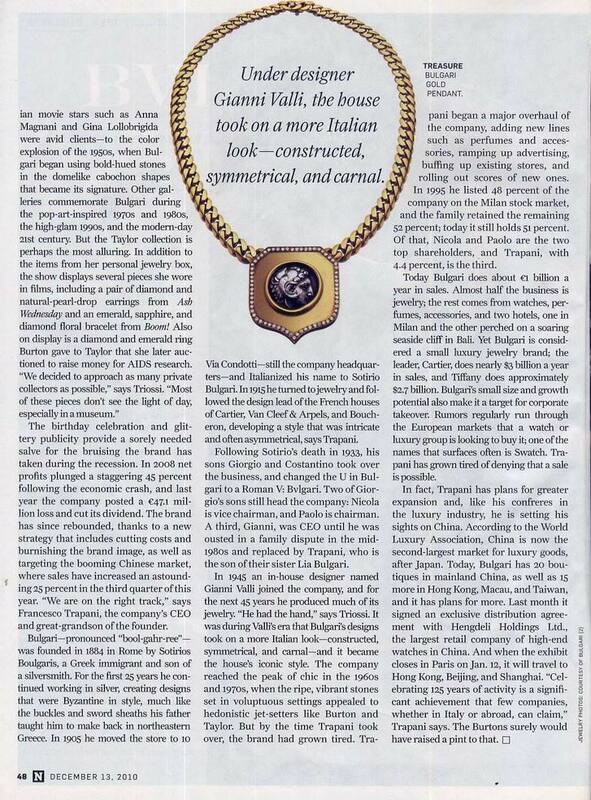 This then led me to curate the first five major exhibitions on Bulgari held in Rome, Paris, Beijing, Shanghai and San Francisco. 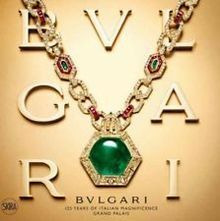 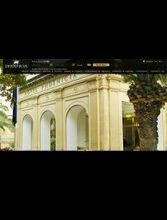 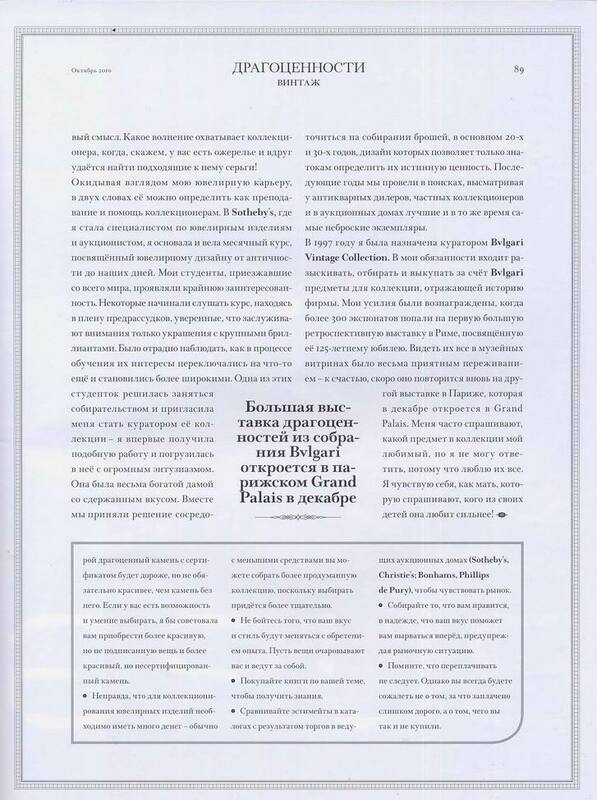 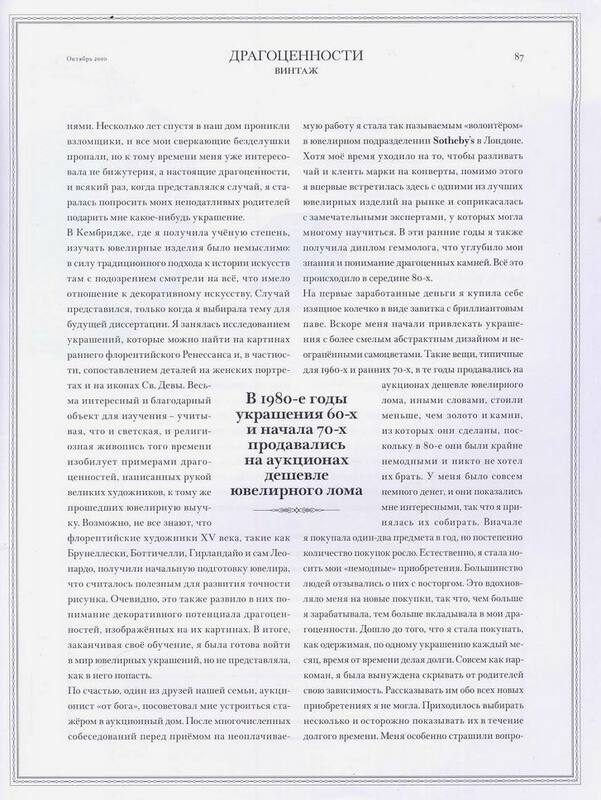 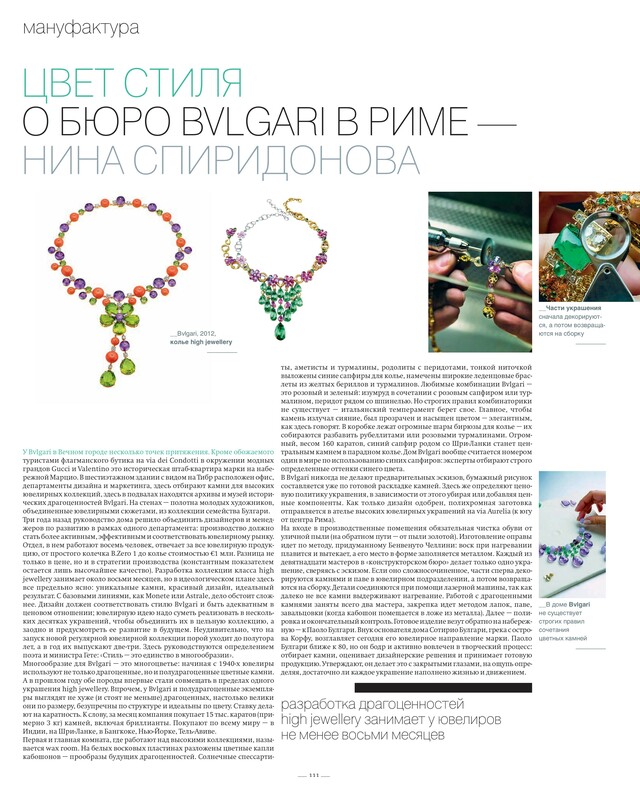 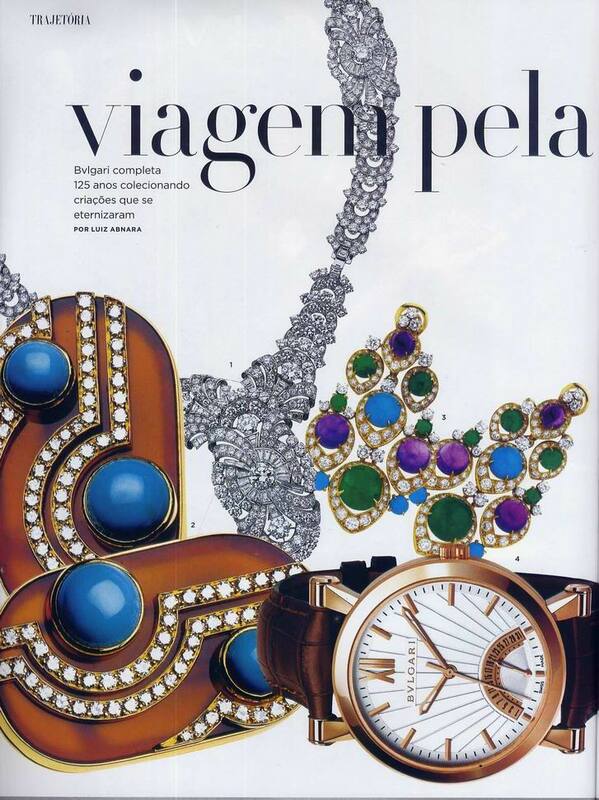 Today I am recognized as one of the most knowledgeable experts of Bulgari. 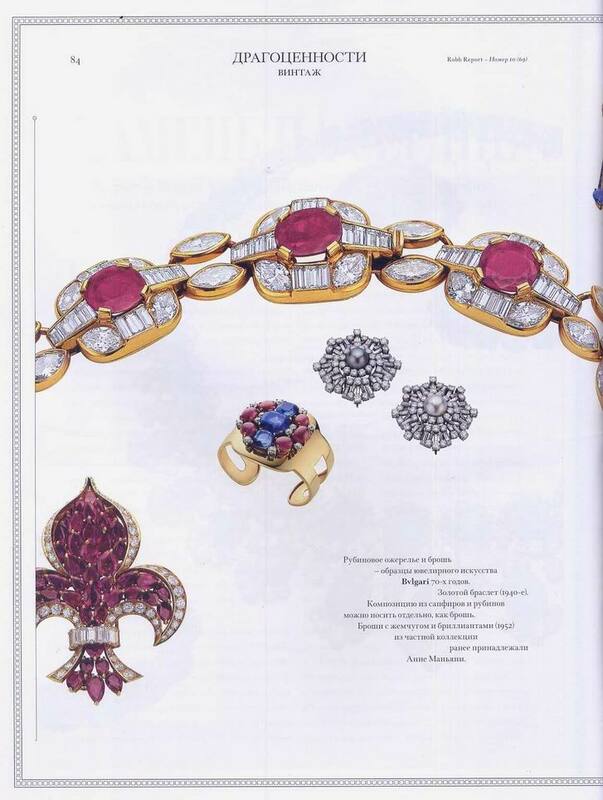 As a consultant I also collaborate with important jewellery houses, among which VBH, Pomellato,Vhernier and Van Cleef & Arpels - L'École. 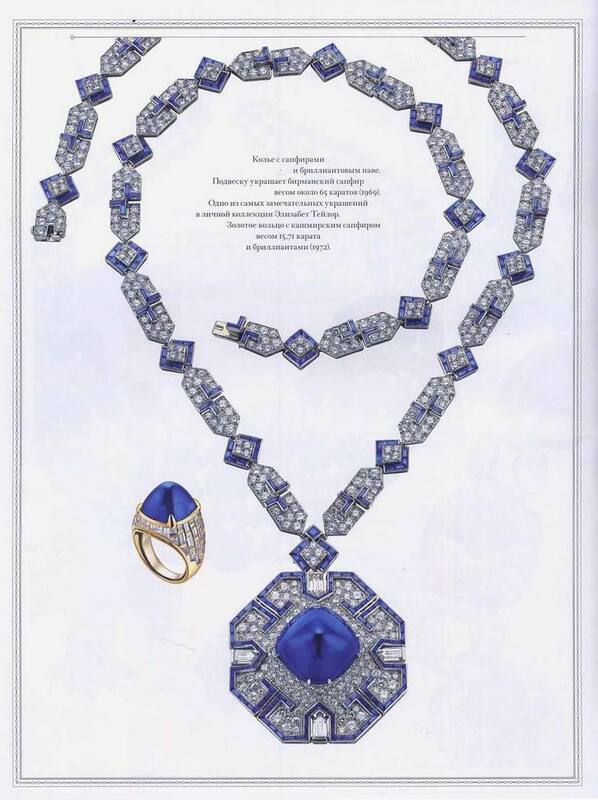 I am a Fellow of the Gemmological Association of Great Britain (FGA). 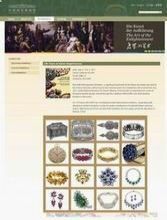 I served on the committee of the Society of Jewellery Historians (UK) and have been a member of the Society since 1985. 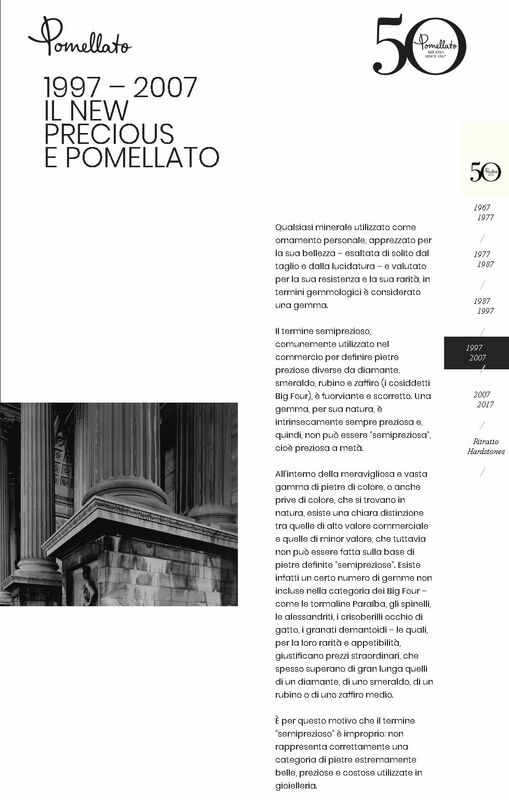 More recently I was elected member of the Università e Nobil Collegio degli Orefici Argentieri e Gioiellieri dell'Alma città di Roma, the goldsmiths' guild established in Rome in 1508. 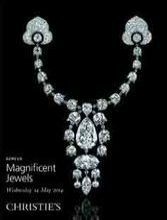 Obviously, my greatest joy comes from wearing or handling a beautiful jewel. 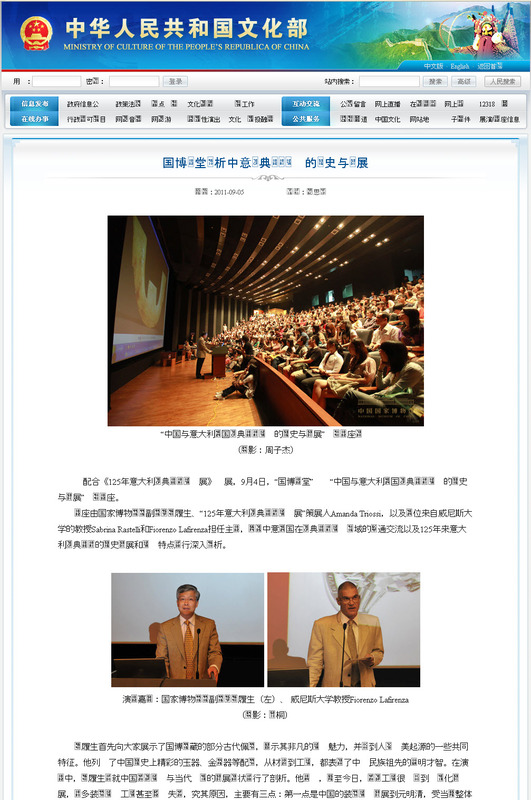 And it is a joy I wish to share with others. 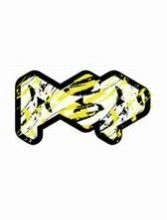 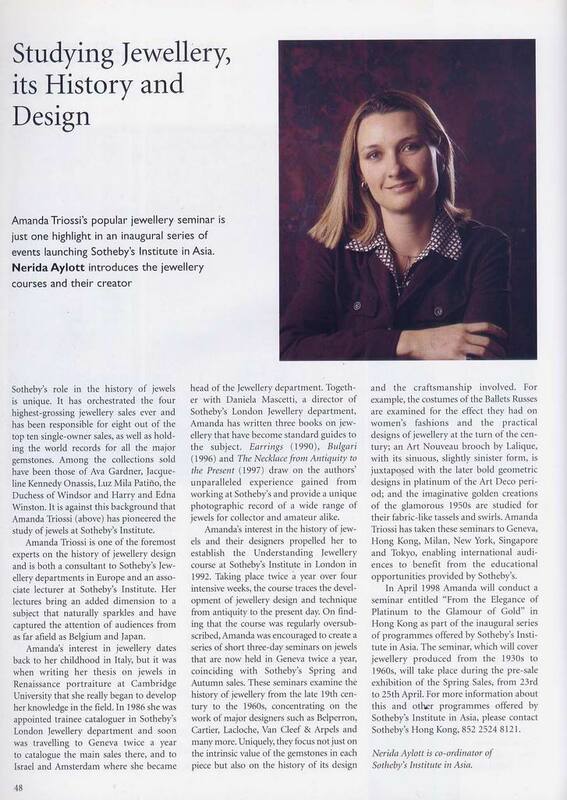 Therefore, alongside jewellery consulting activities, I have been and continue to be involved in jewellery education. 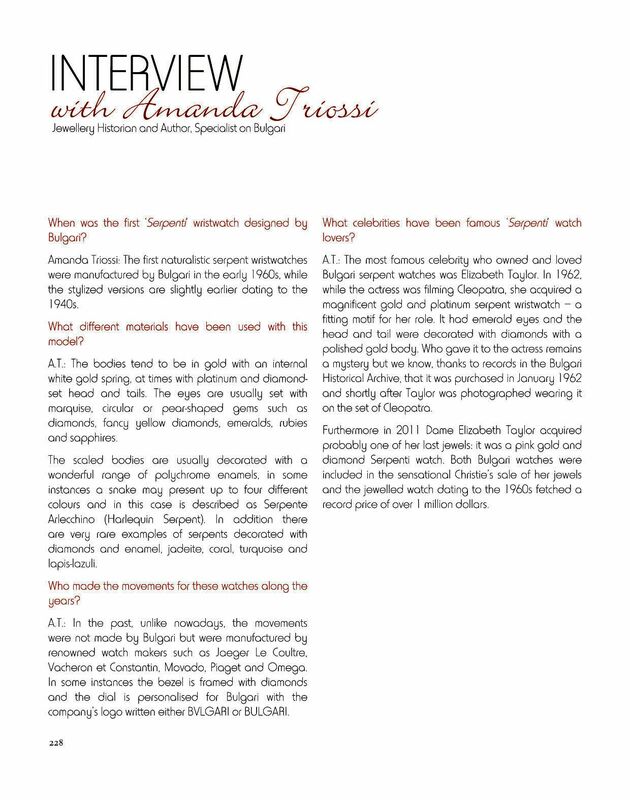 Many still today consider my course "Understanding Jewellery with Amanda Triossi", held at Sotheby's Institute in London from 1992 to 2000, a milestone in jewellery studies. 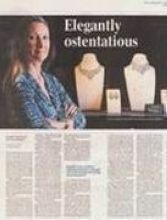 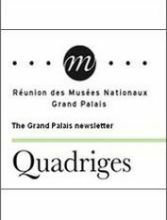 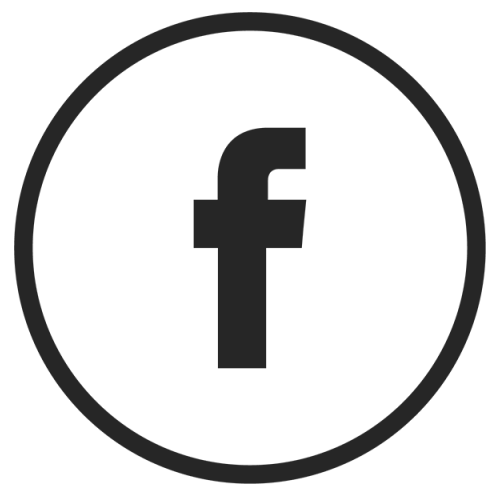 jewellery designers, manufacturers, sales' staff, art historians, antique and period jewellery dealers, appraisers, gemmologists, stylists, collectors, and jewellery amateurs. 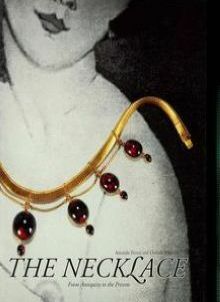 One cannot exclude either all those stunning women who wear jewels on the red carpet and are too often unaware of what they are wearing and how to wear them to the best advantage. 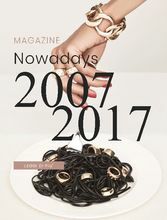 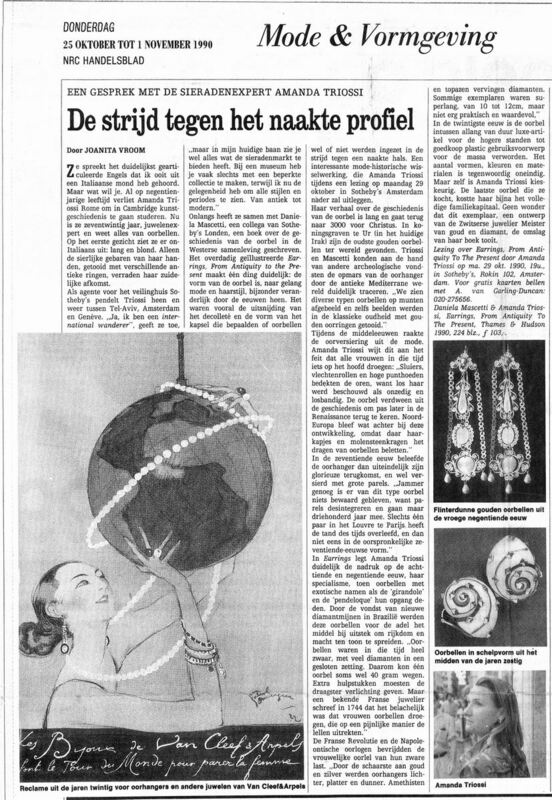 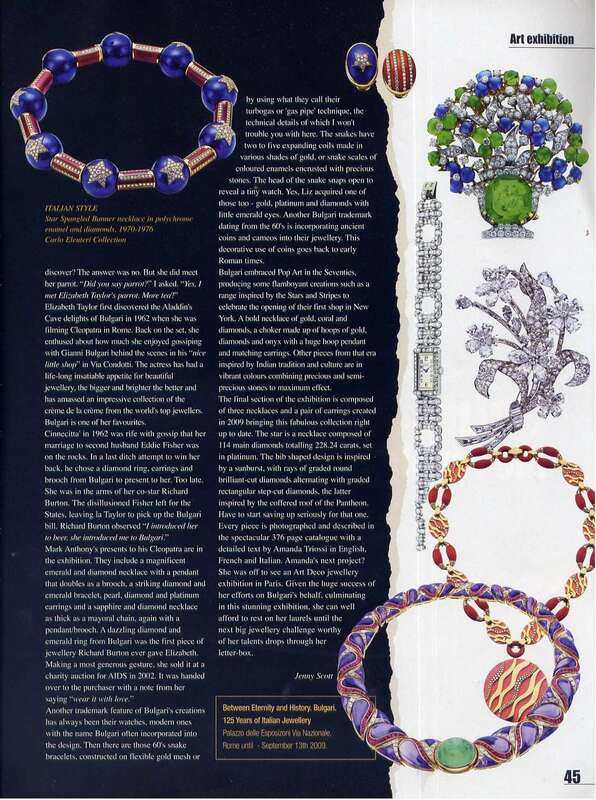 Especially now when a great number of those jewellery houses, that made the history of jewellery design in the 20th century, have become part of luxury conglomerates and multinationals, are becoming distant from their initial world of rarefied and exclusive jewellery, knowledge and understanding of the sublime art of jewellery is even more important. 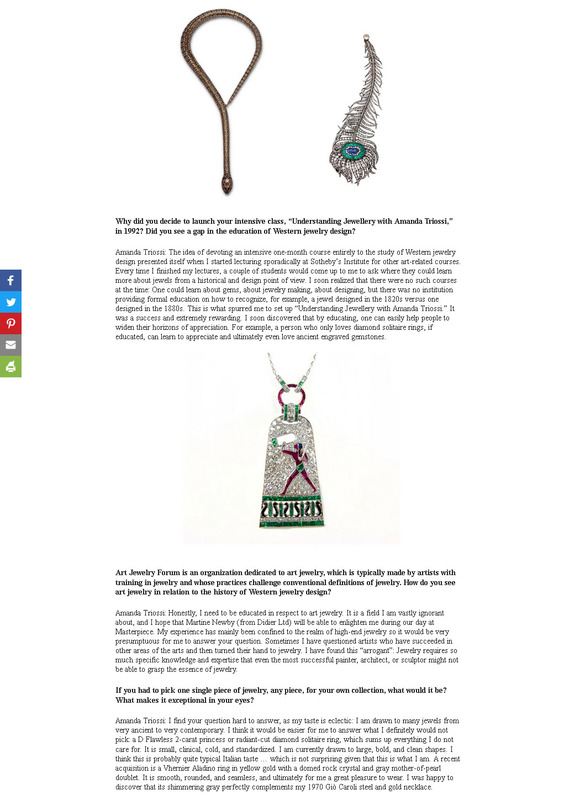 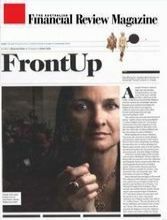 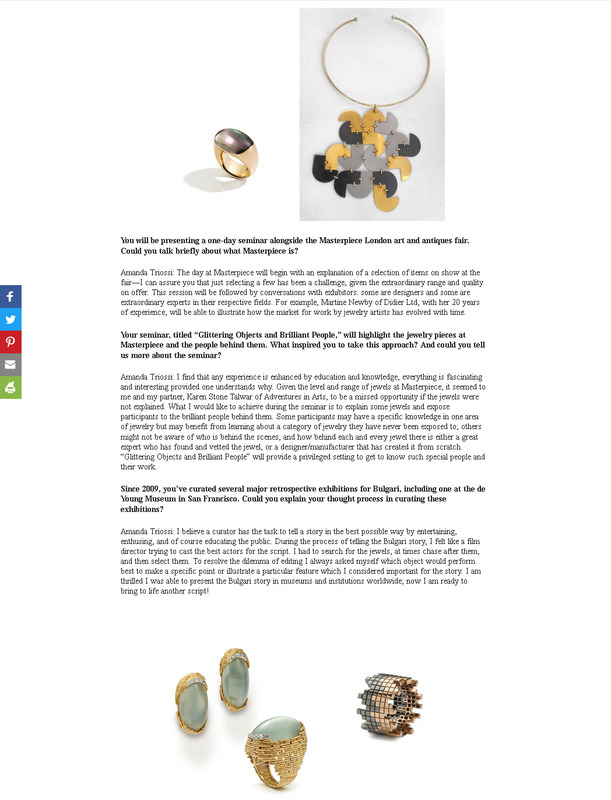 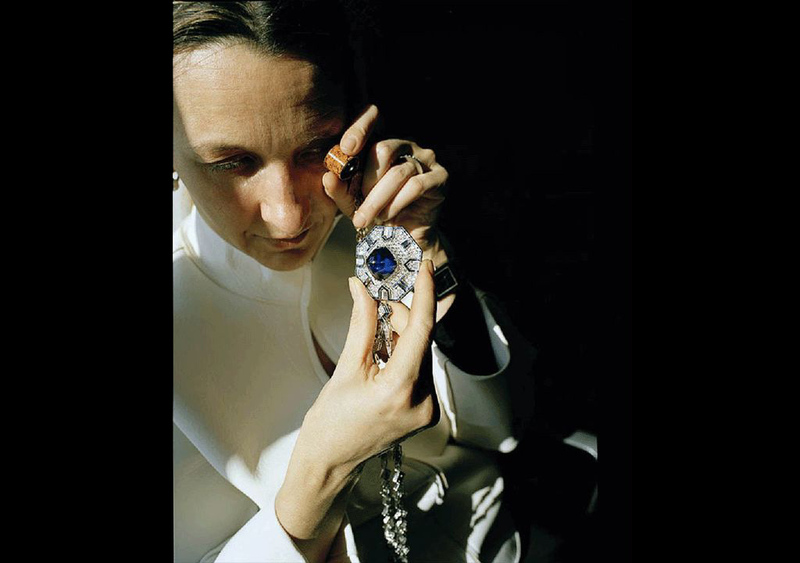 Amanda Triossi curates jewellery exhibitions. 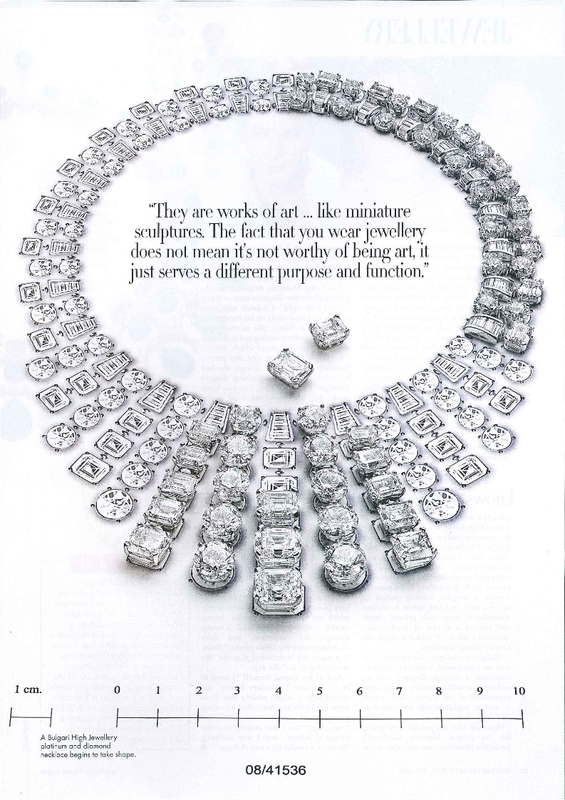 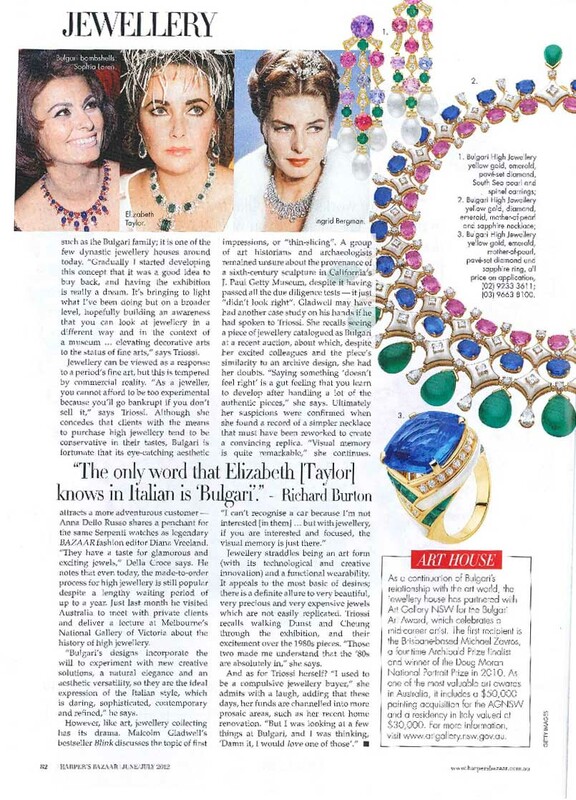 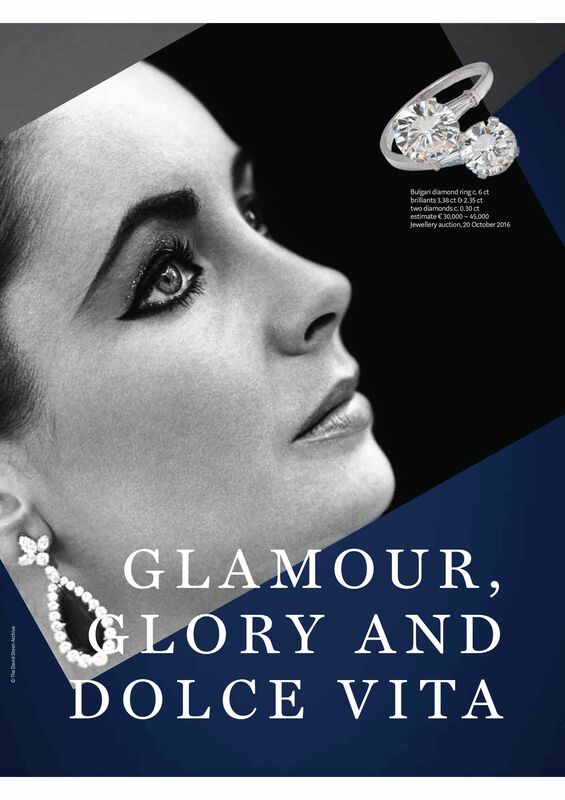 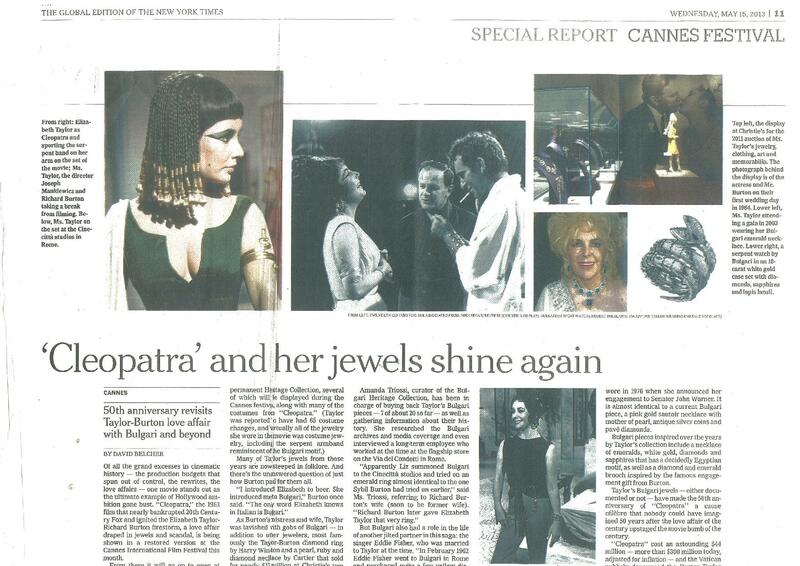 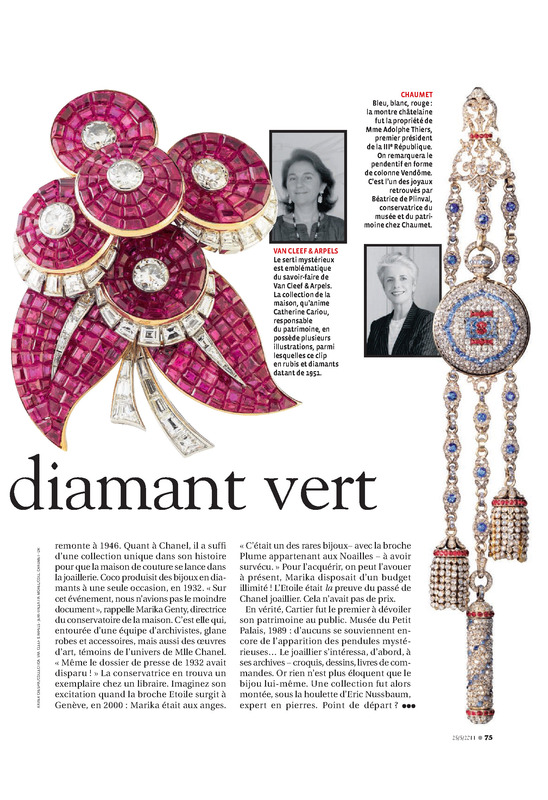 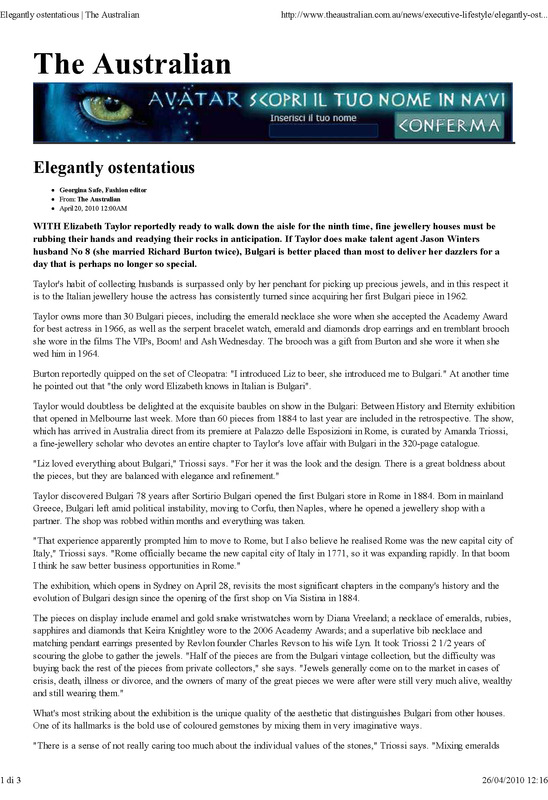 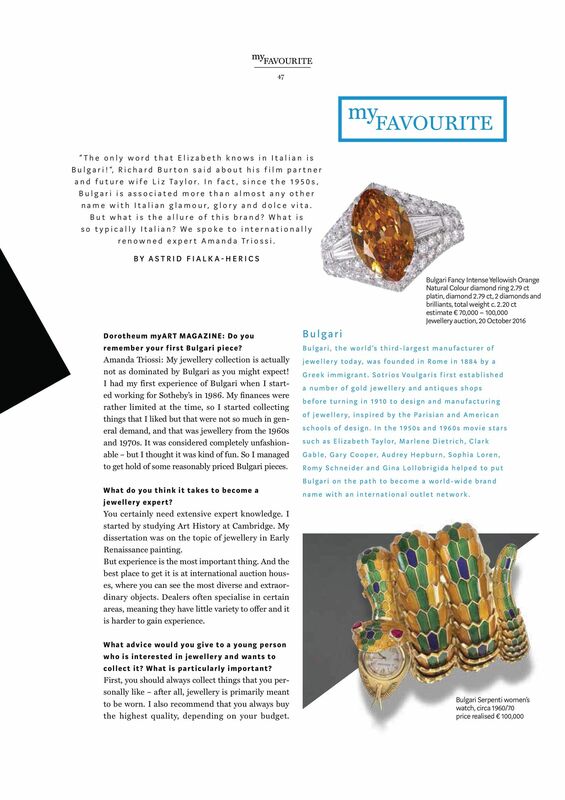 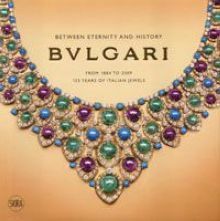 Her recent major exhibition has been the retrospective on the jewellery house Bulgari. 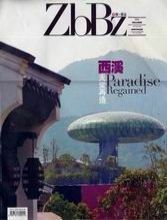 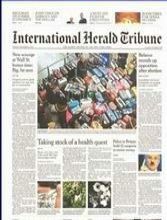 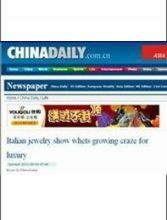 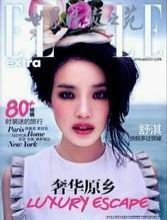 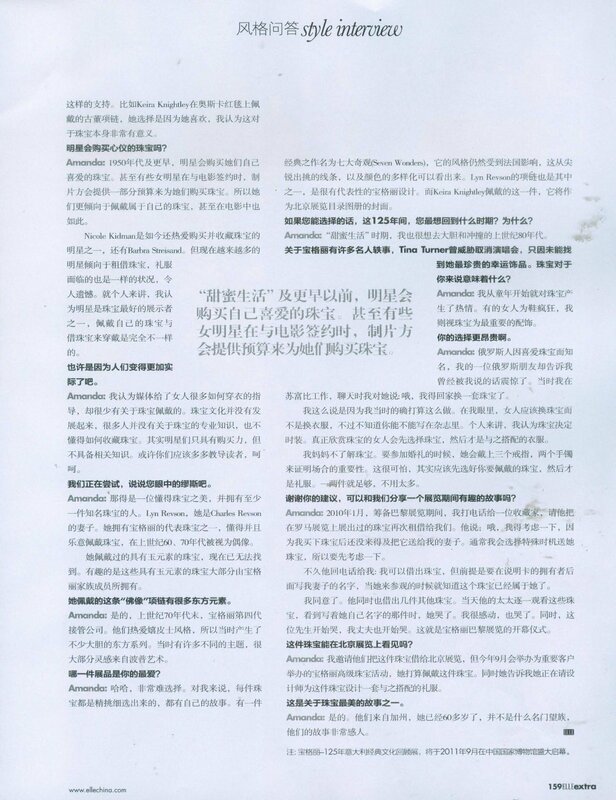 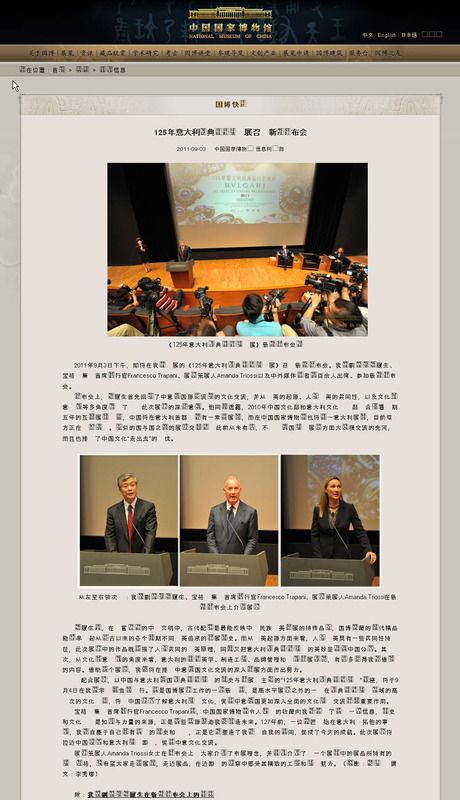 With over 600 objects, they were held in Rome, in Paris, in Beijing and Shanghai. 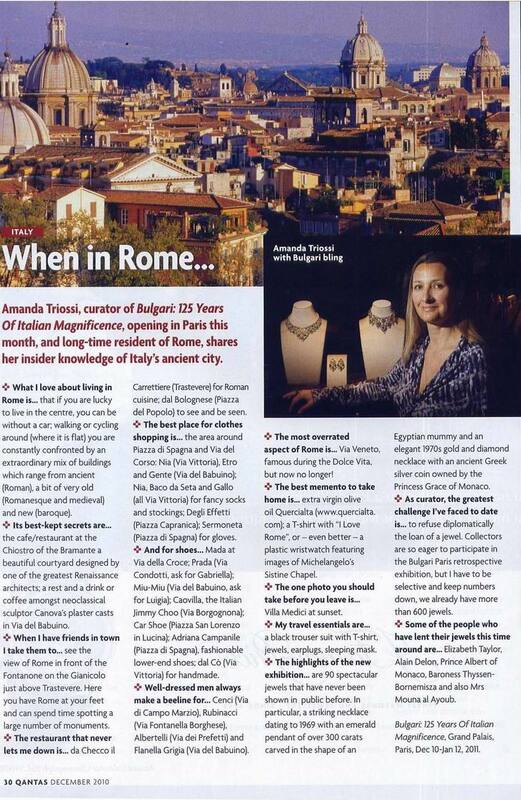 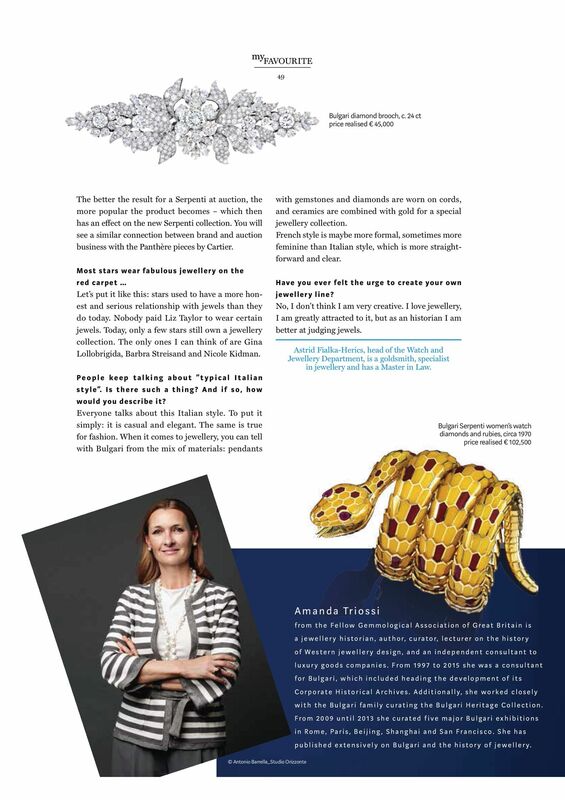 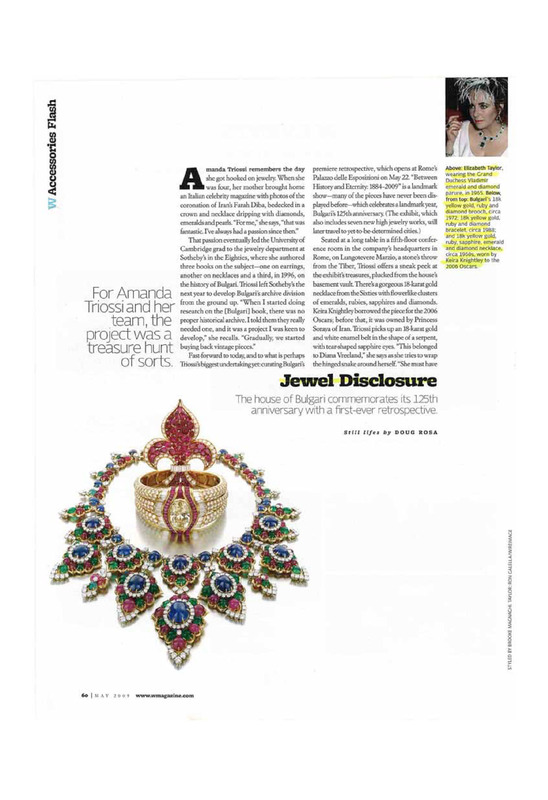 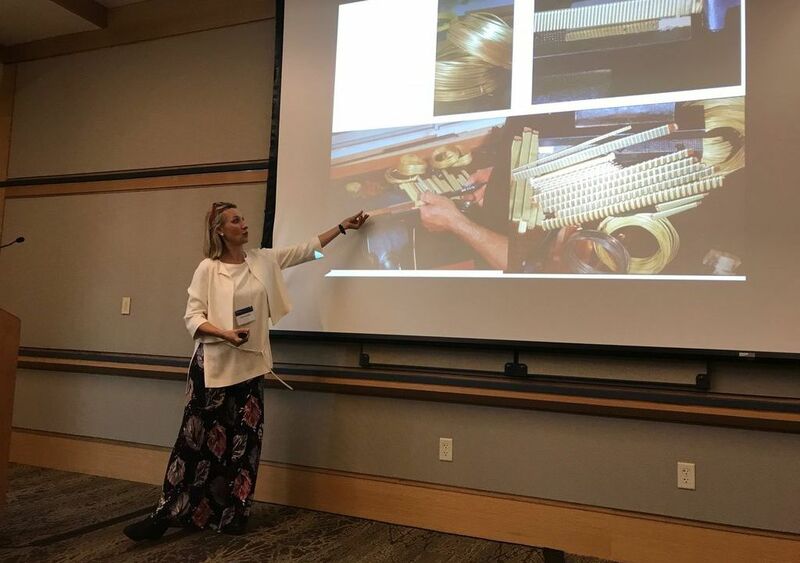 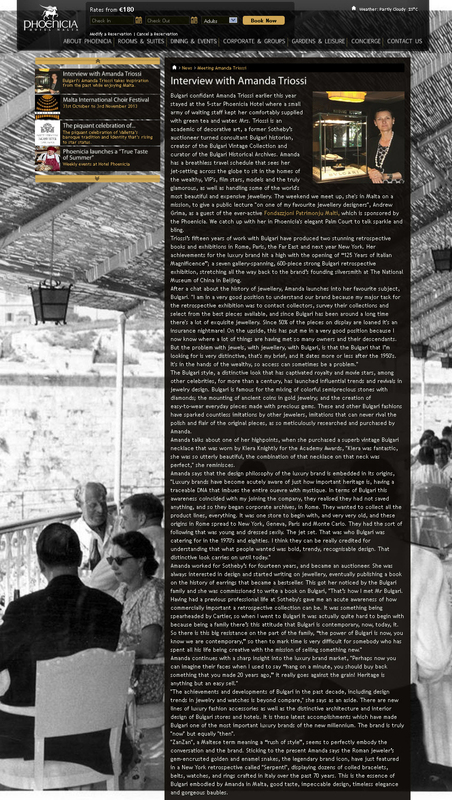 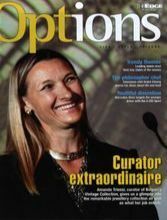 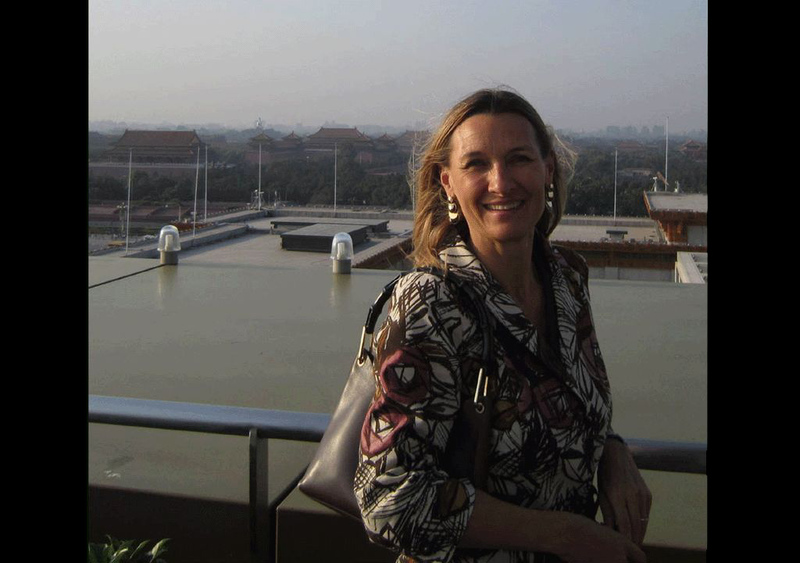 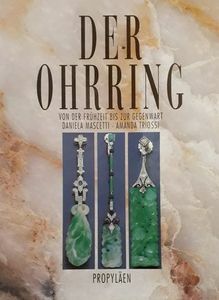 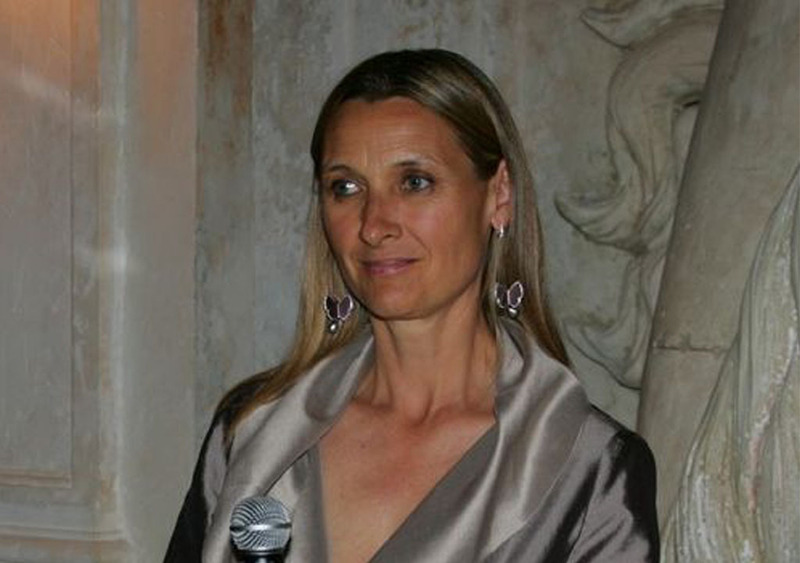 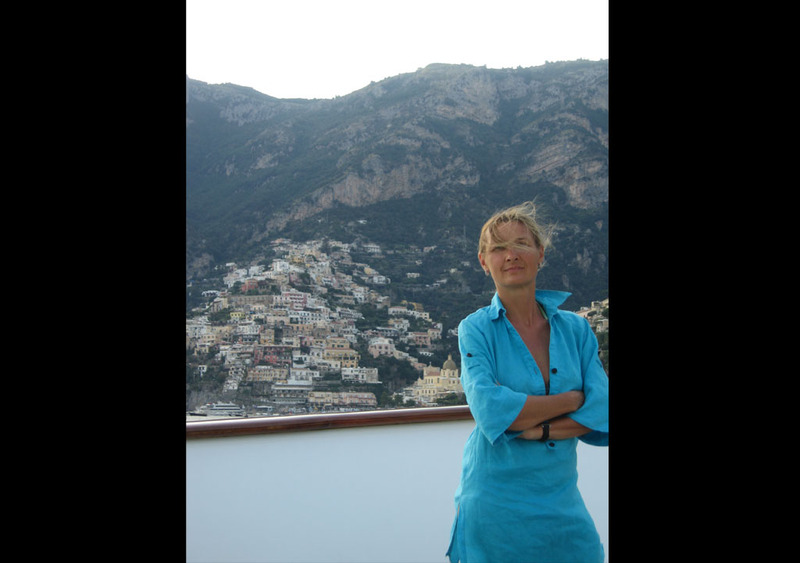 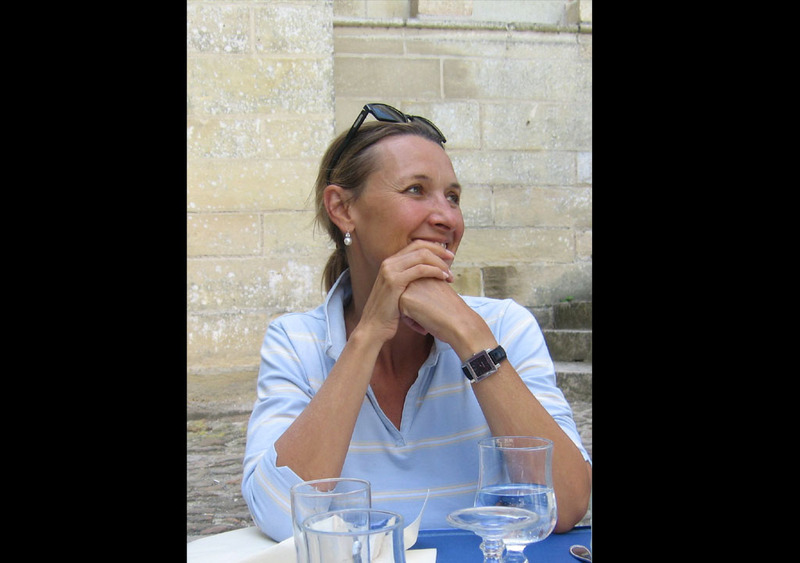 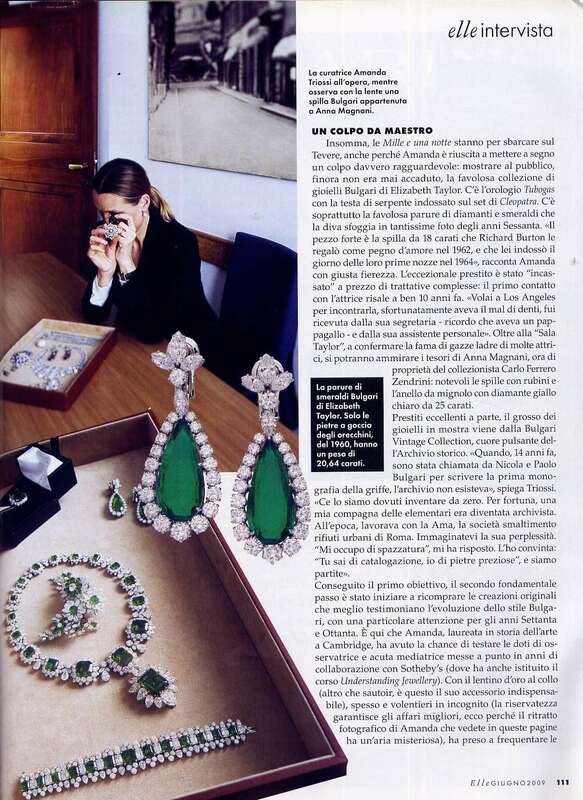 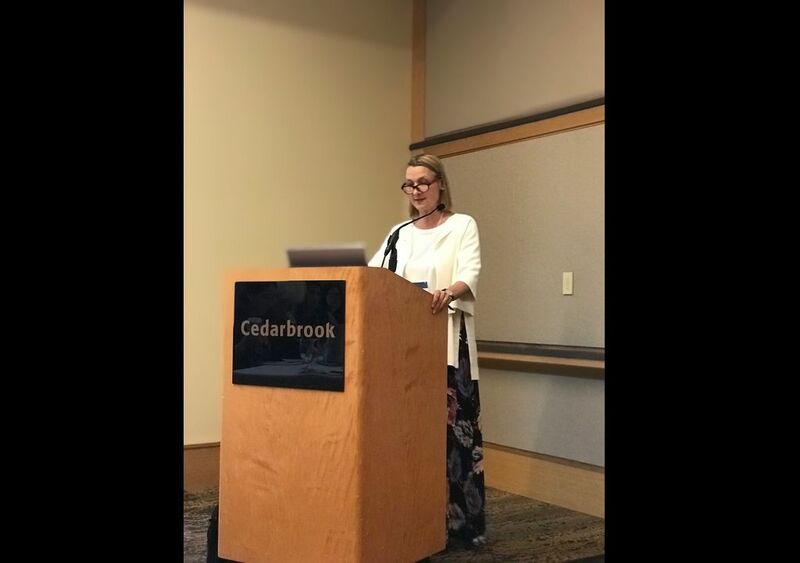 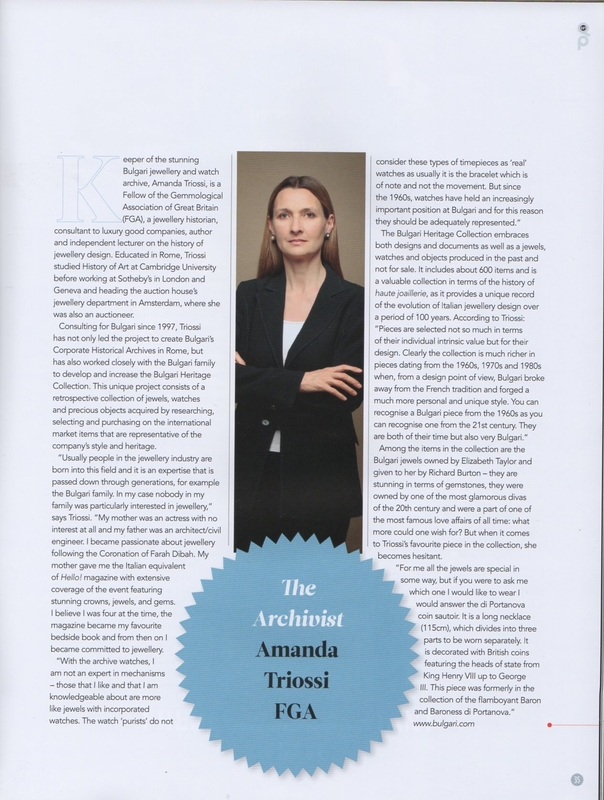 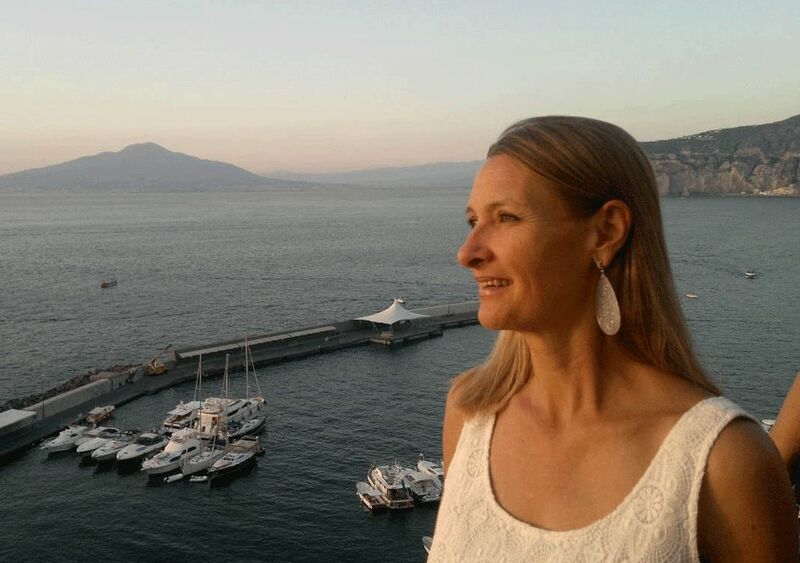 Amanda Triossi MA in Art History and FGA Fellow of the Gemmologica Association of Great Britain, reserchese, catalogues, authenticate and appraises jewels for private individuals as well as companies. 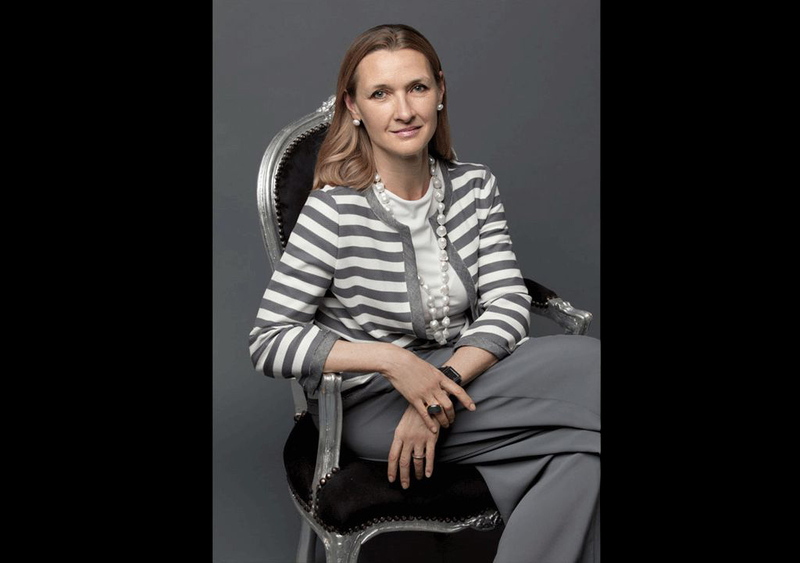 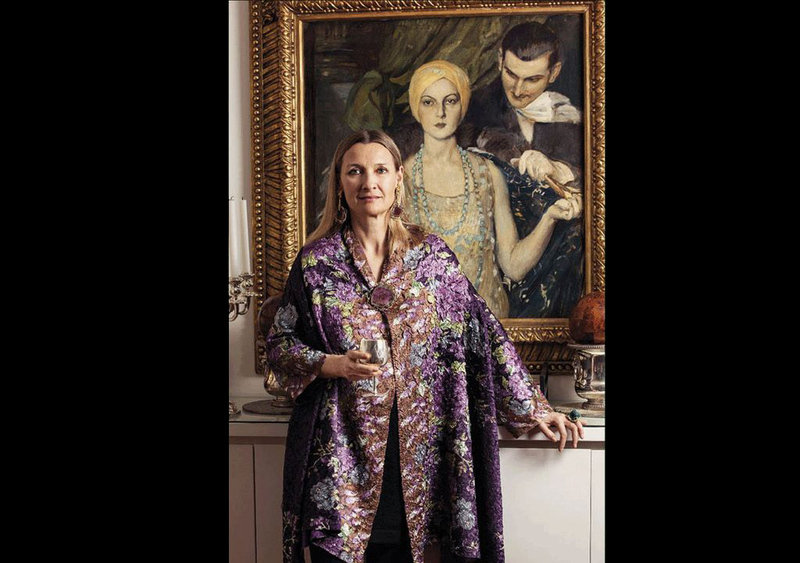 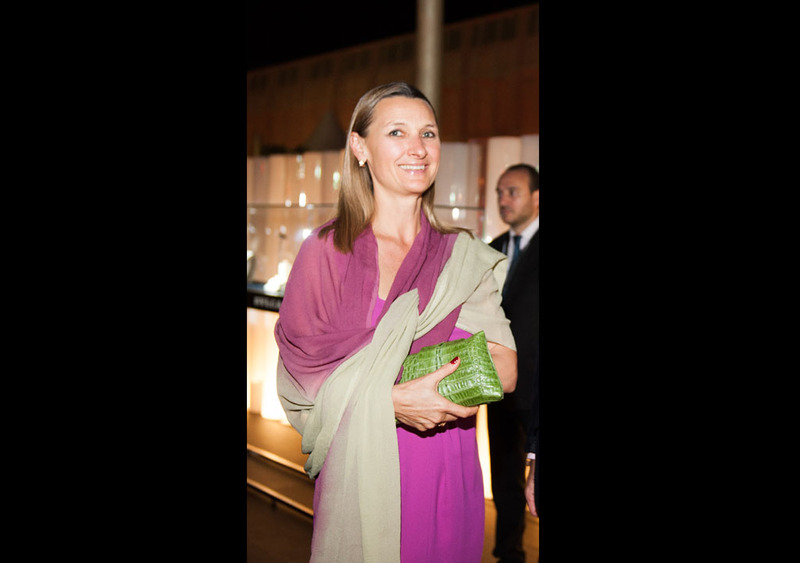 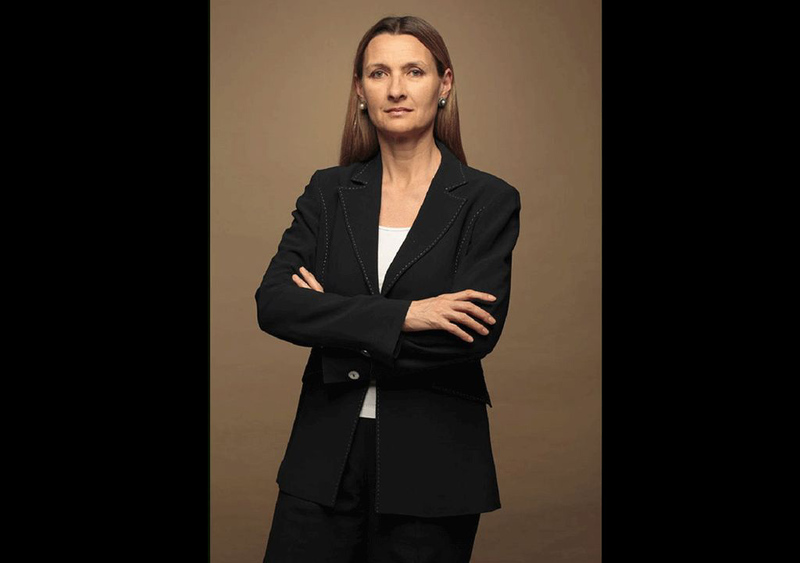 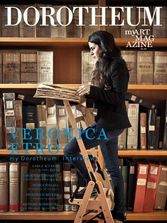 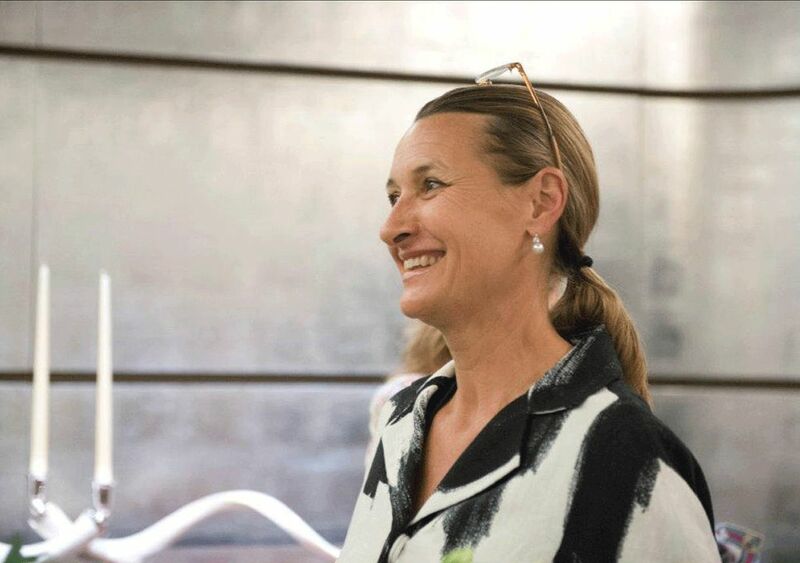 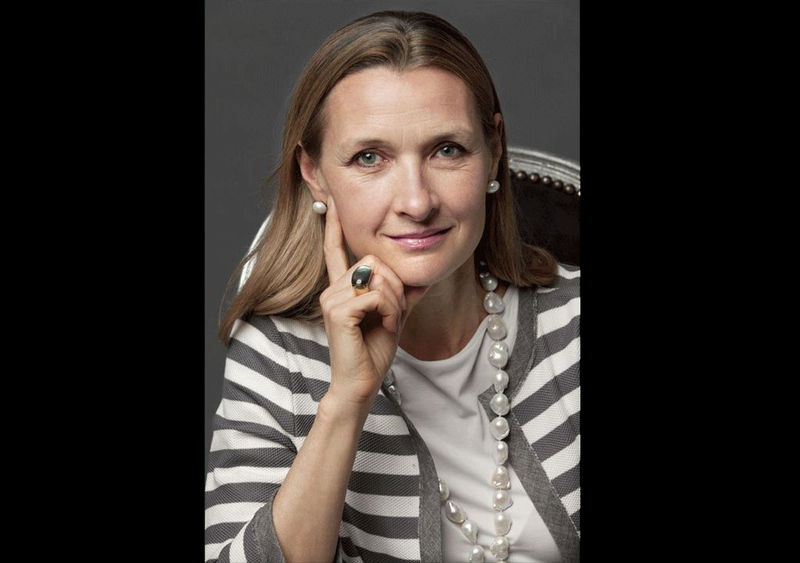 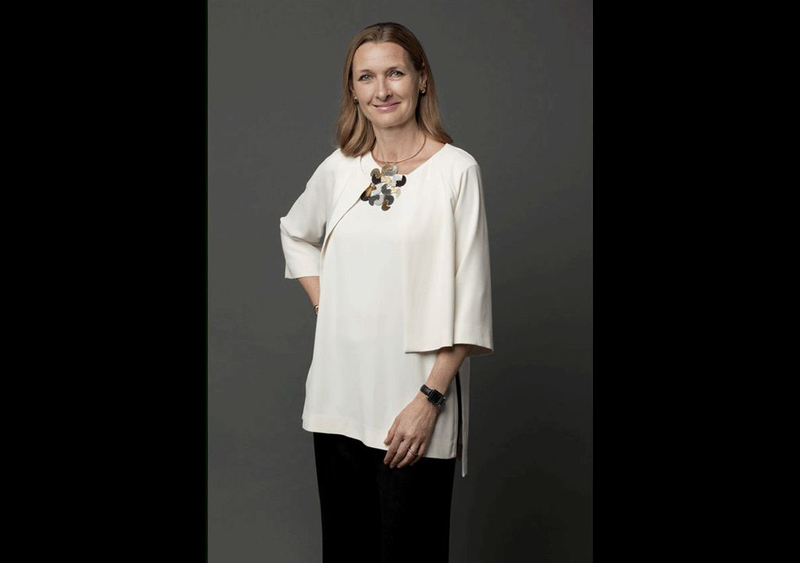 She worked for fourteen years for the international auction house Sotheby's in jewellery department and eighteen years as curator of the Bulgari Heritage Collection. 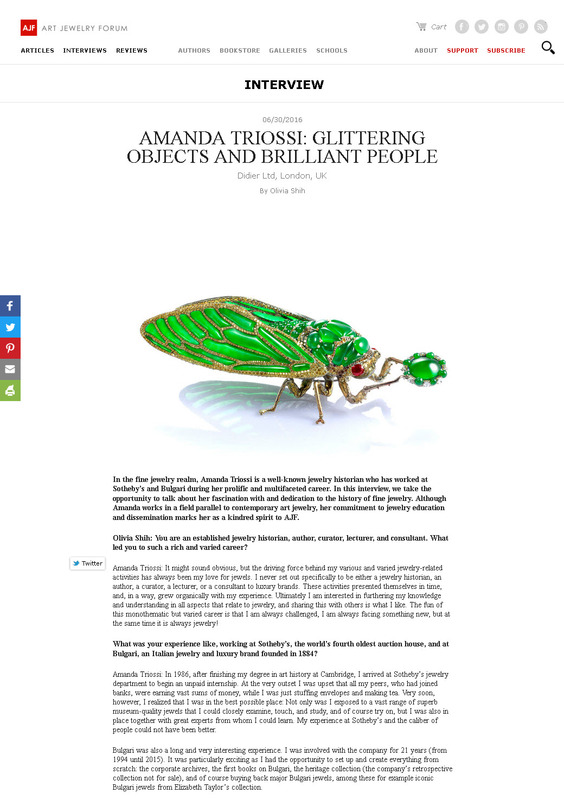 Amanda Triossi researches and presents bespoke lectures for academic and private institutions.Her lectures have a reputation for being informative as well as entertaining. 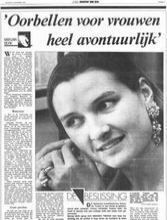 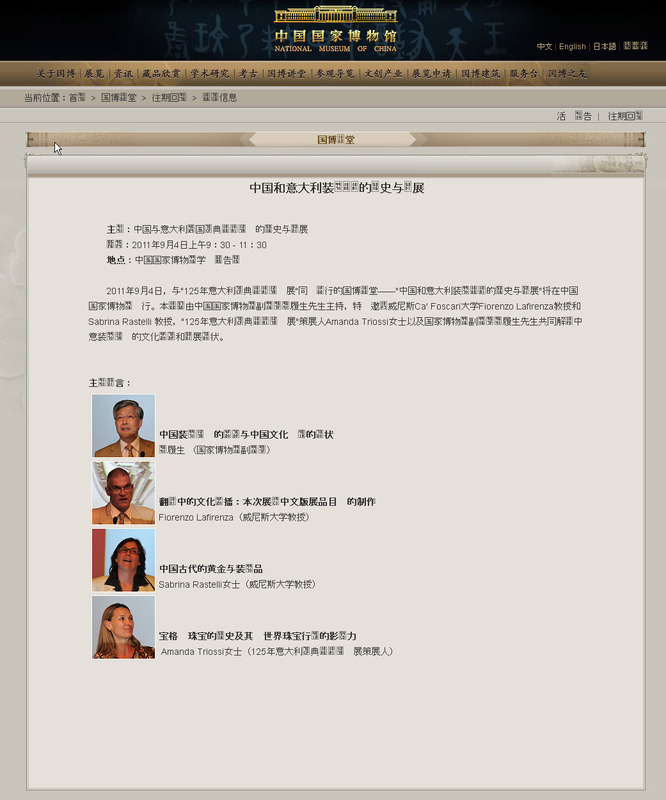 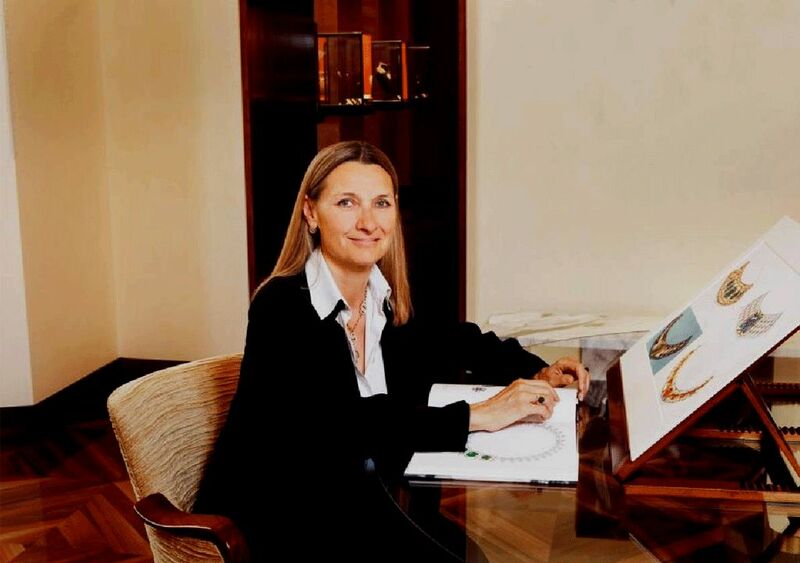 She has held worldwide seminars ans courses on the history of jewellery. 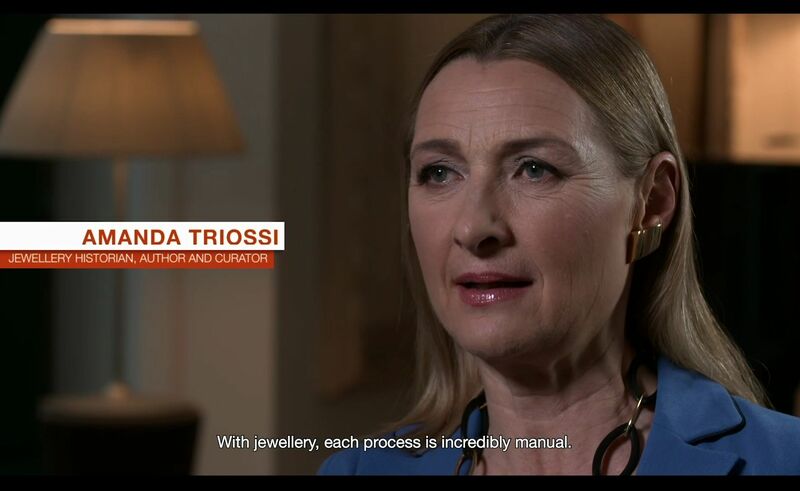 The outstanding reputation of the intensive "Understanding Jewellery with Amanda Triossi" course, held in London for Sotheby's from 1992-2000, and her world-wide short seminars continues into the 21st century. 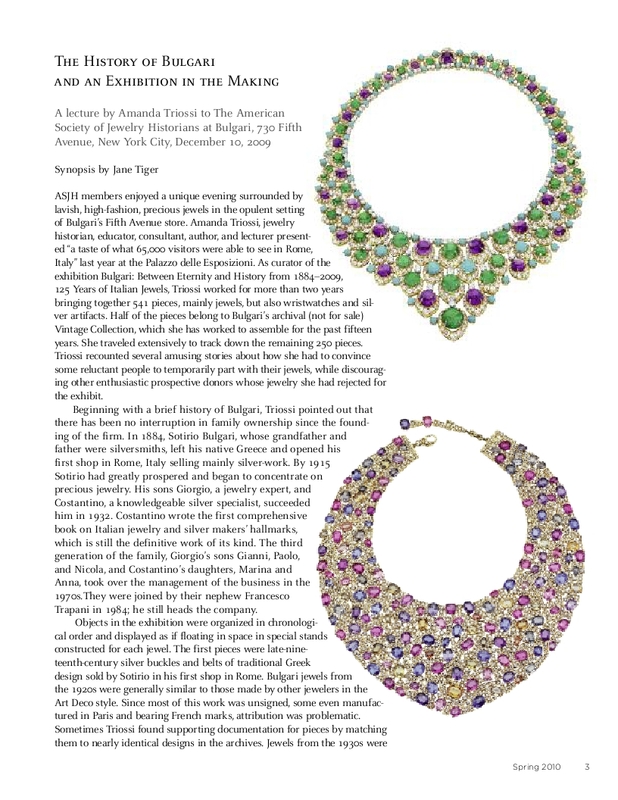 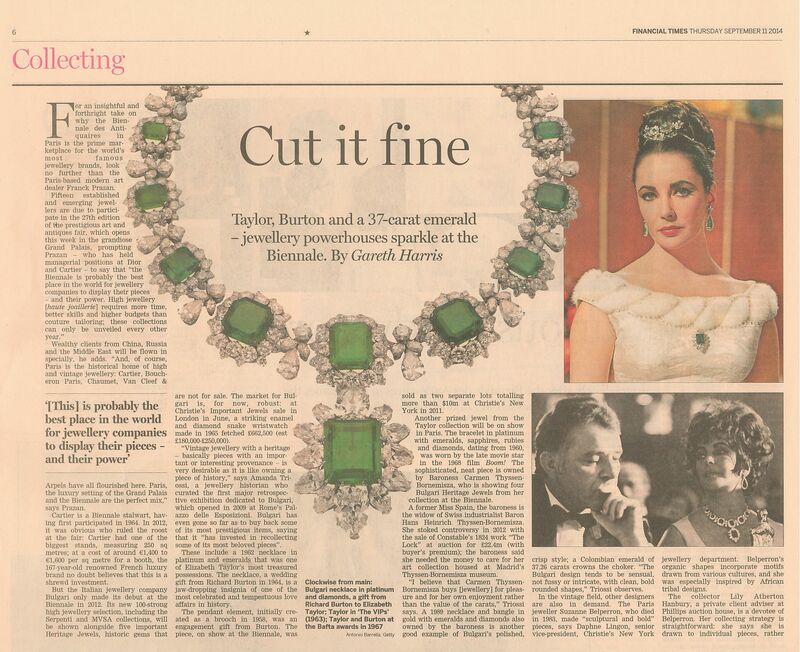 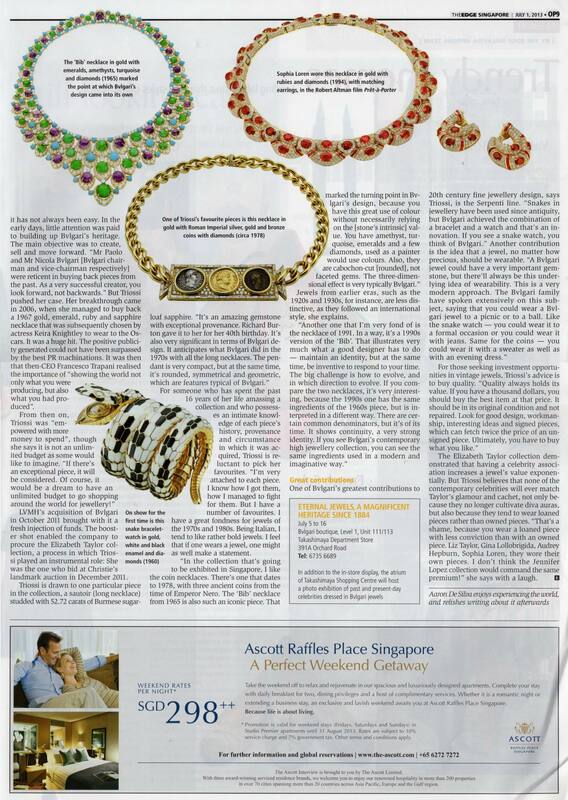 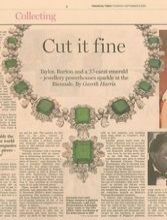 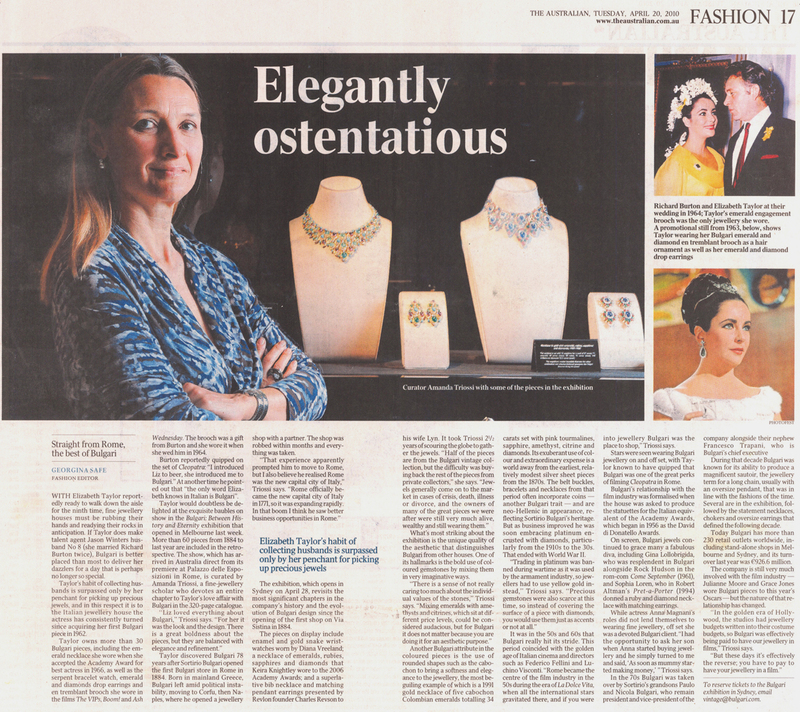 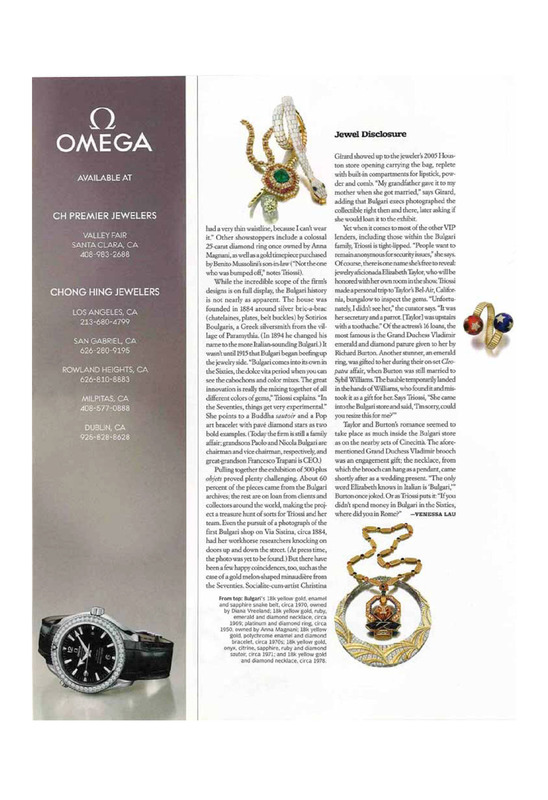 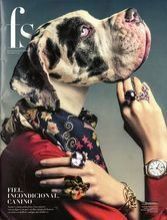 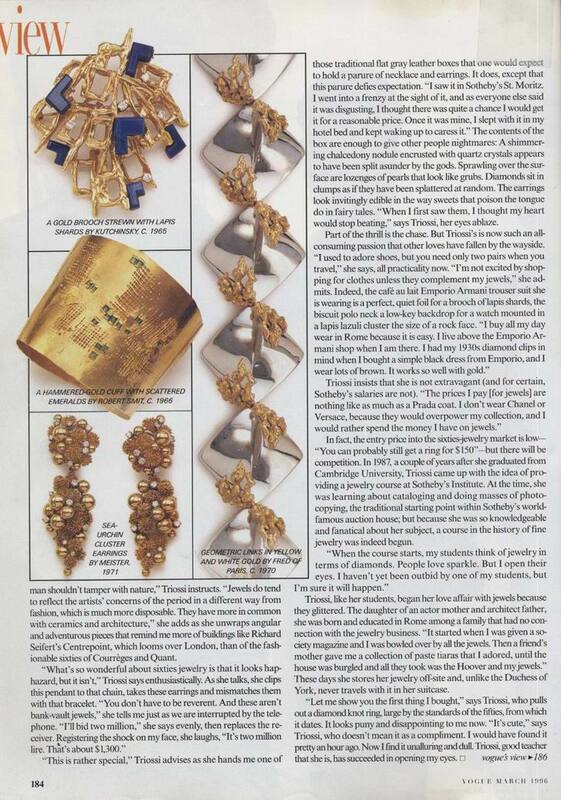 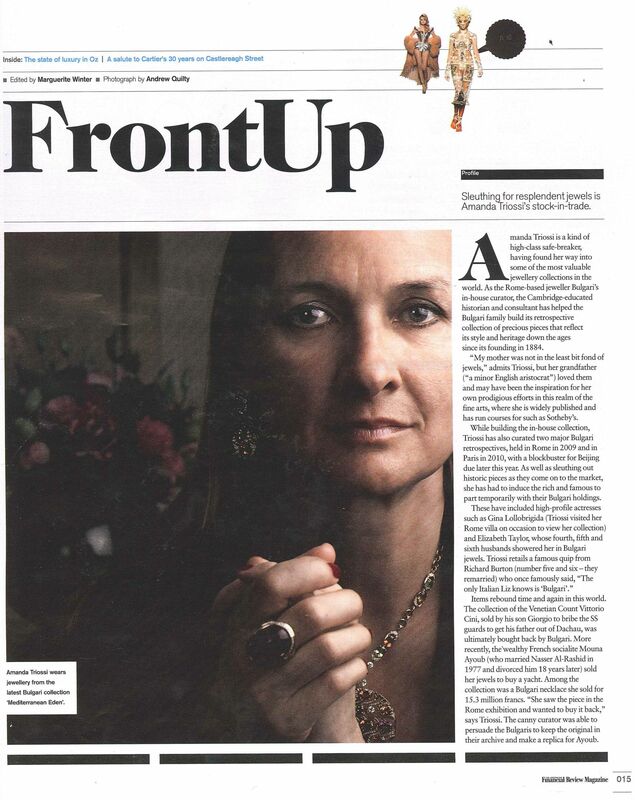 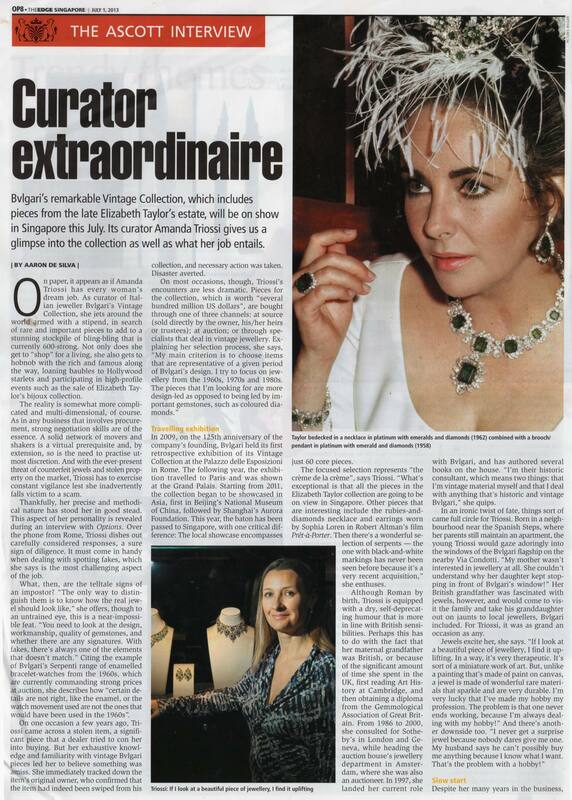 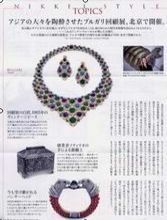 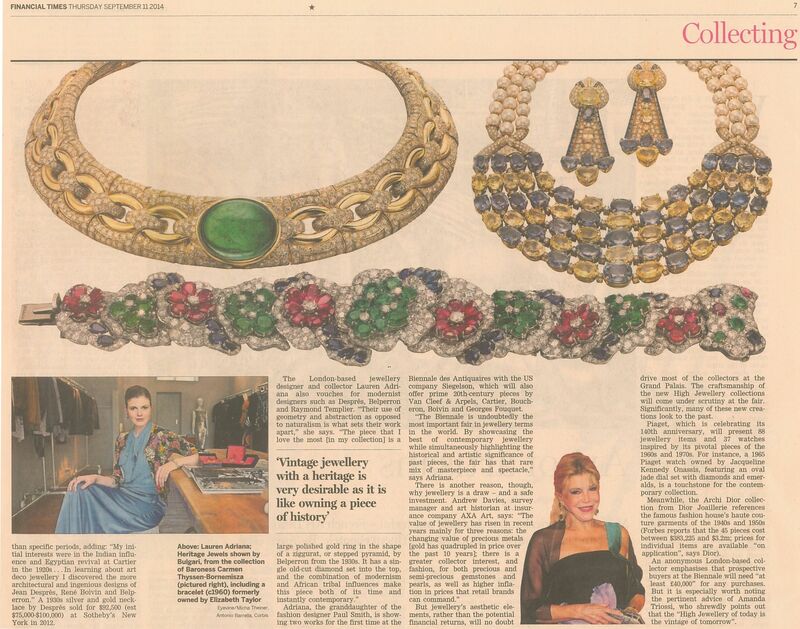 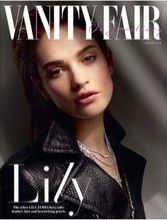 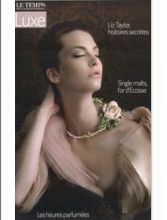 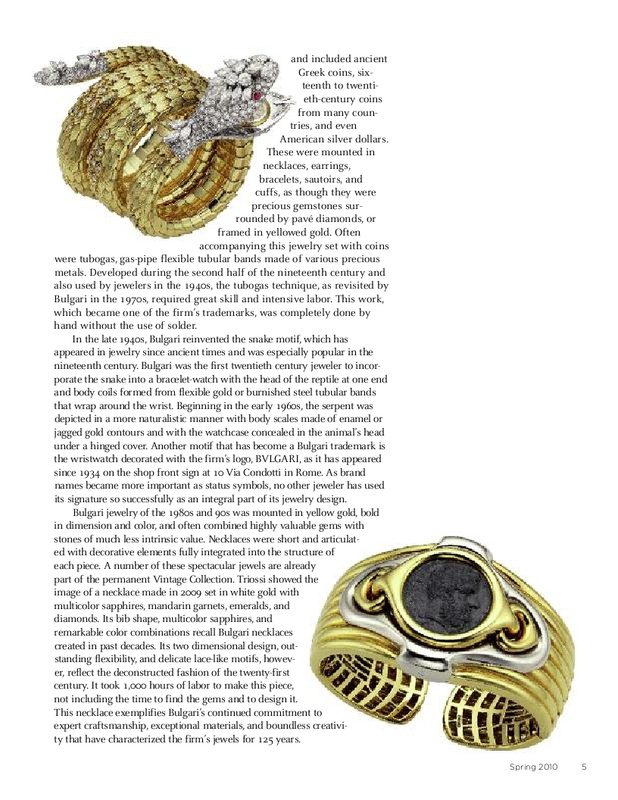 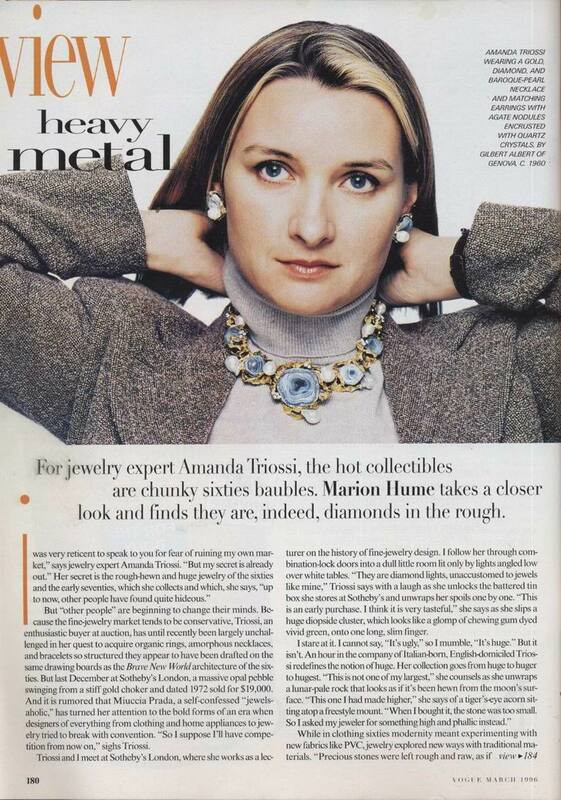 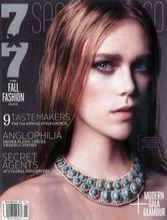 Amanda Triossi curates collections of 19th and 20th century jewellery for private individuals as well as companies. 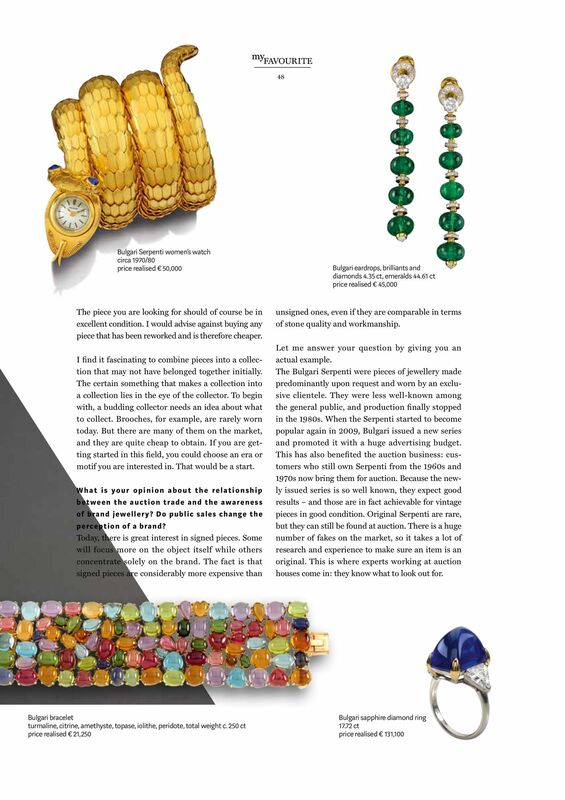 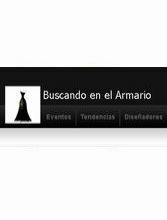 She advises what to buy and is able to source best jewels. 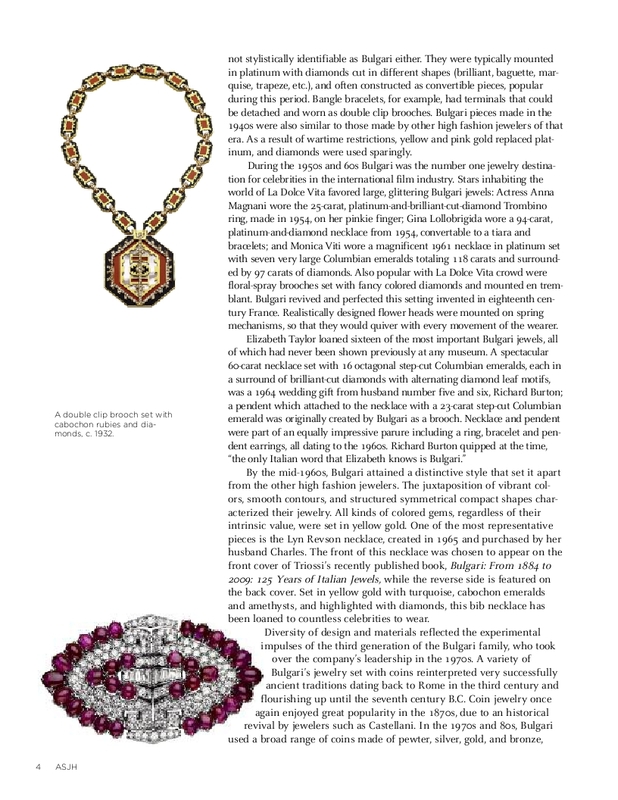 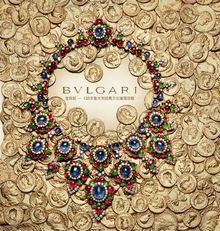 She initiated and built up the Bulgari Heritage Collection over a period of 18 years. 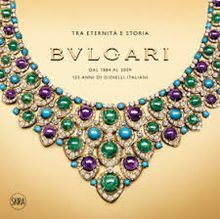 Jewels made of rare and precious materials are a distinctive characteristic of us humans and date back to the dawn of civilization. 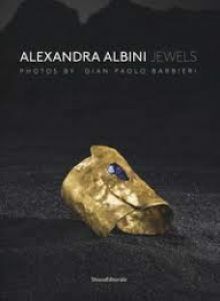 Anthropologist and archaeologists believe that primitive men began to be interested in personal adornment at the time when they began to use words: this explains why jewels feature in the earliest archaeological finds. 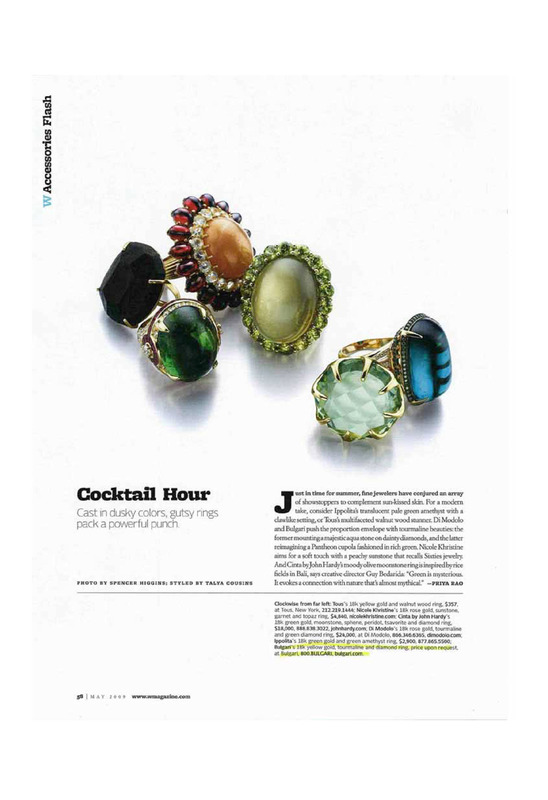 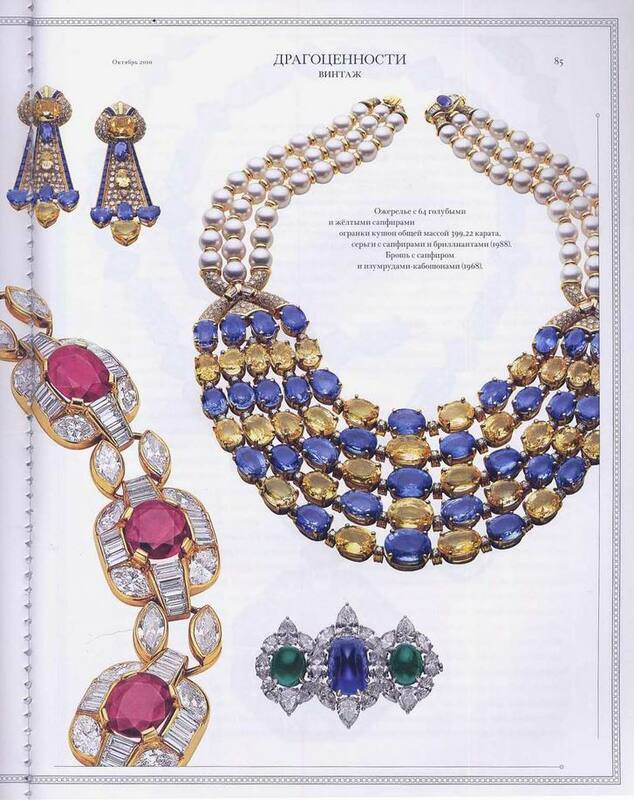 From these early days jewels have never ceased to be owned and coveted by men and women world-wide. 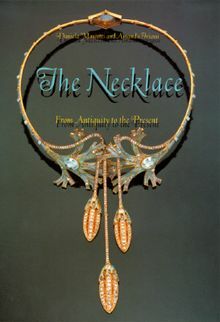 Jewels are an expression of wealth, power and status, they serve as talismans and amulets, they are barometers of economic and social history, they are closely linked to the discoveries of precious deposits whether metals or gems, they are intimately associated to history of fashion, they depend on the advancement of technology and they are a magnificent small scale art form, in most cases intrinsically precious. 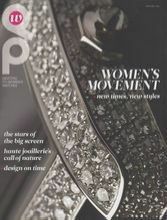 Jewels appeal to all people, to all classes and to all genders, so ultimately they are trans-cultural, trans-social and trans-gender. For all the above and many more reasons, I believe jewels are a fascinating subject matter worthy of study and possibly of greater understanding. 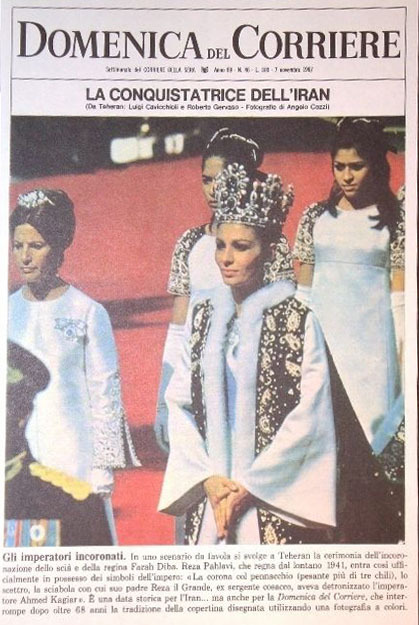 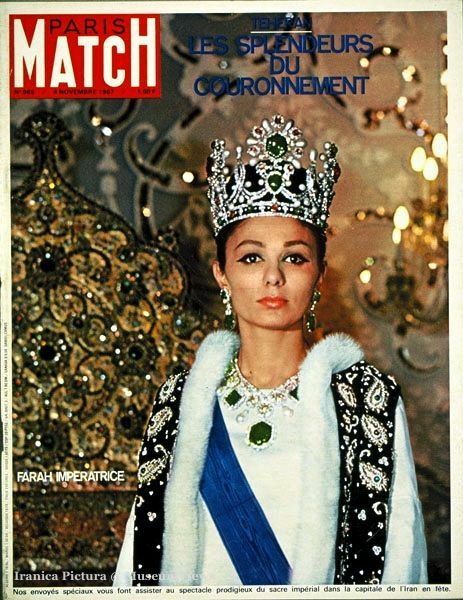 My initial passion for jewels was sparked as child when I saw photographs of the Coronation of the Sha of Persia and the Empress Farah Diba. 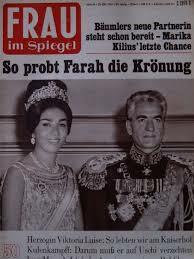 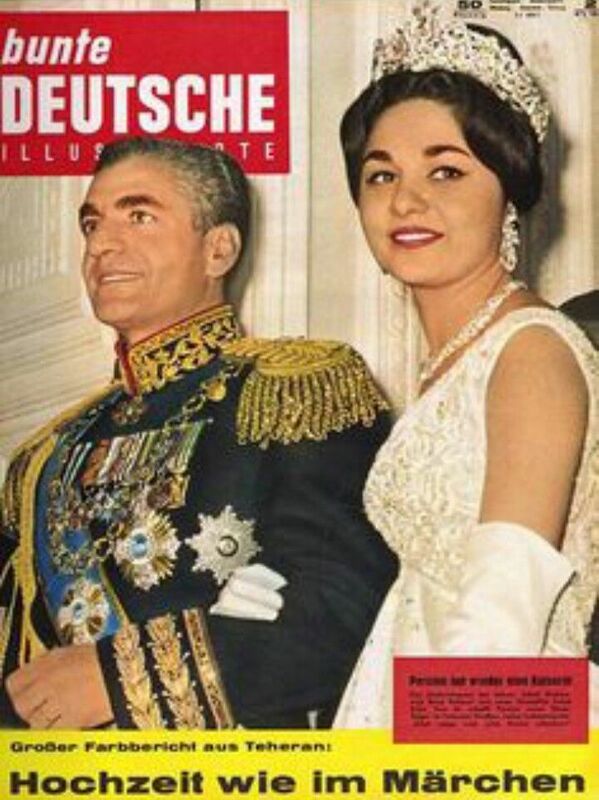 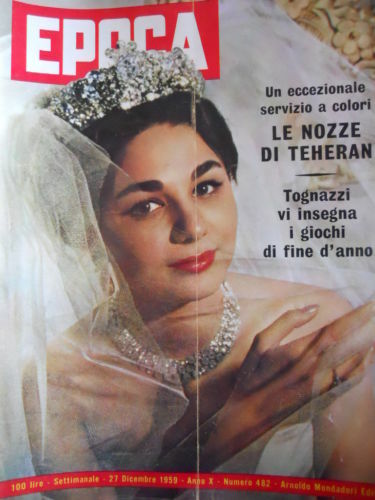 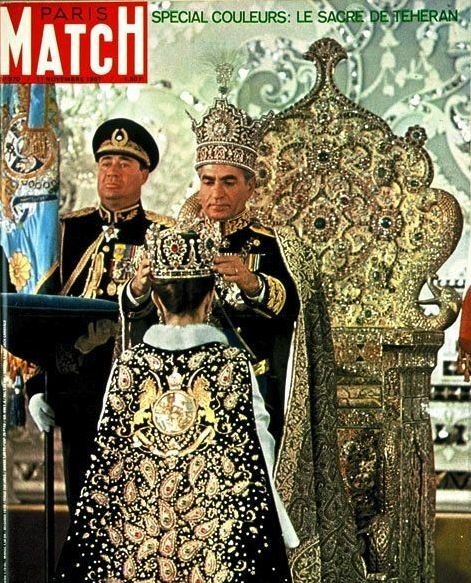 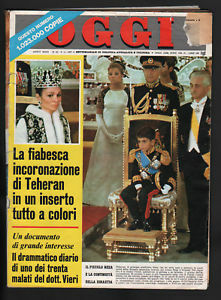 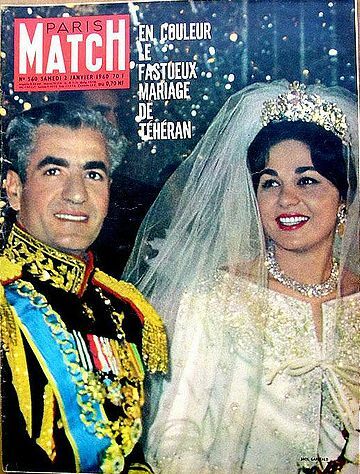 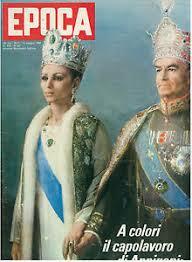 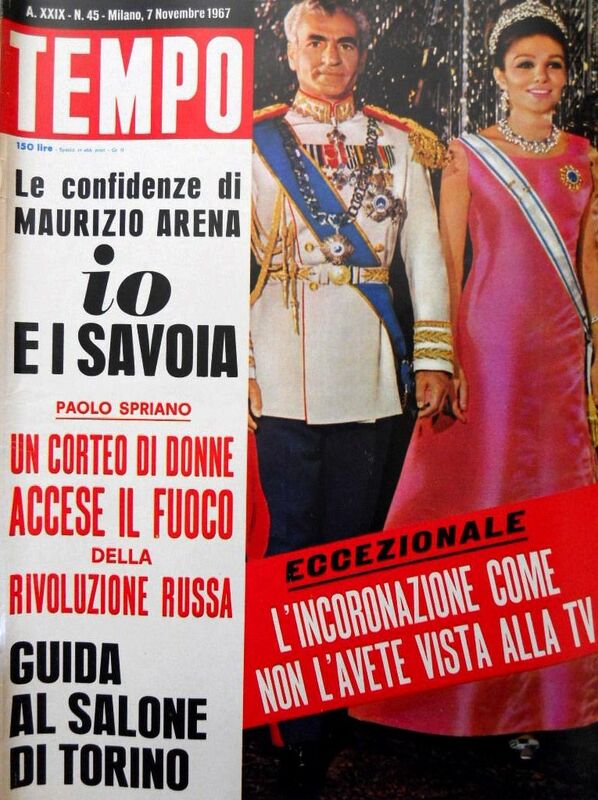 At the age of four, my mother gave me a magazine with pictures of the coronation ceremony of Reza Pahlavi, Iran's King of Kings. 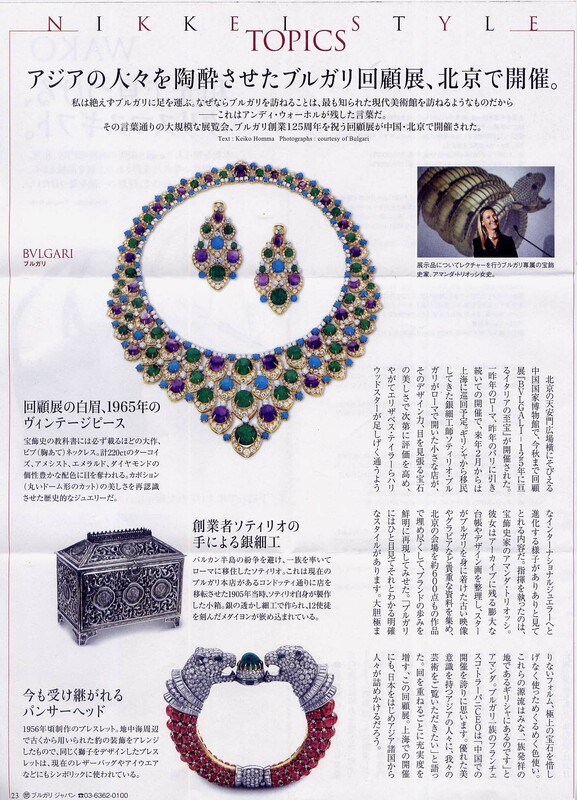 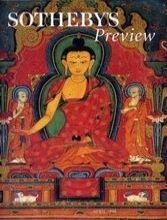 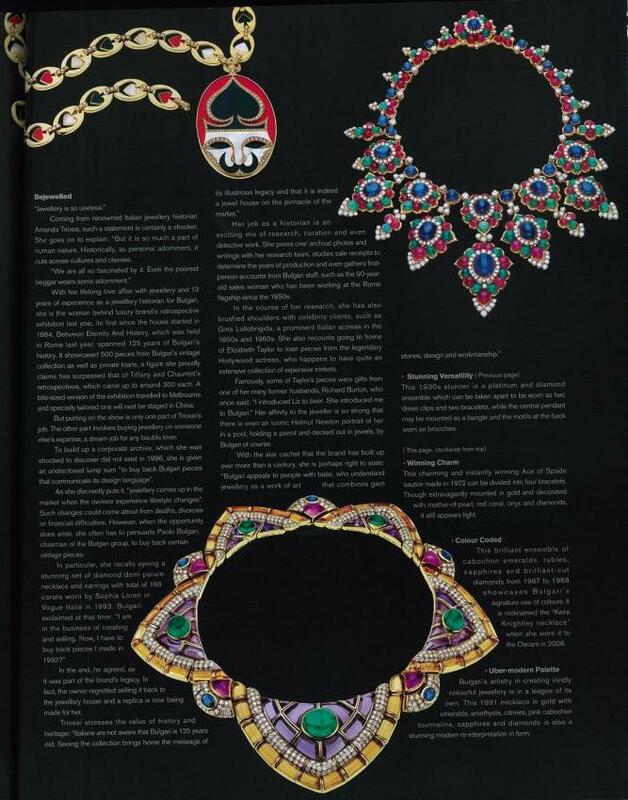 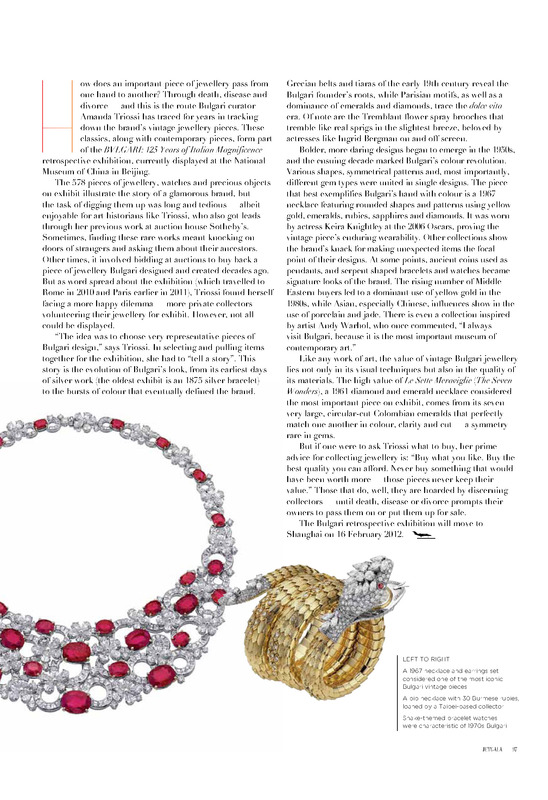 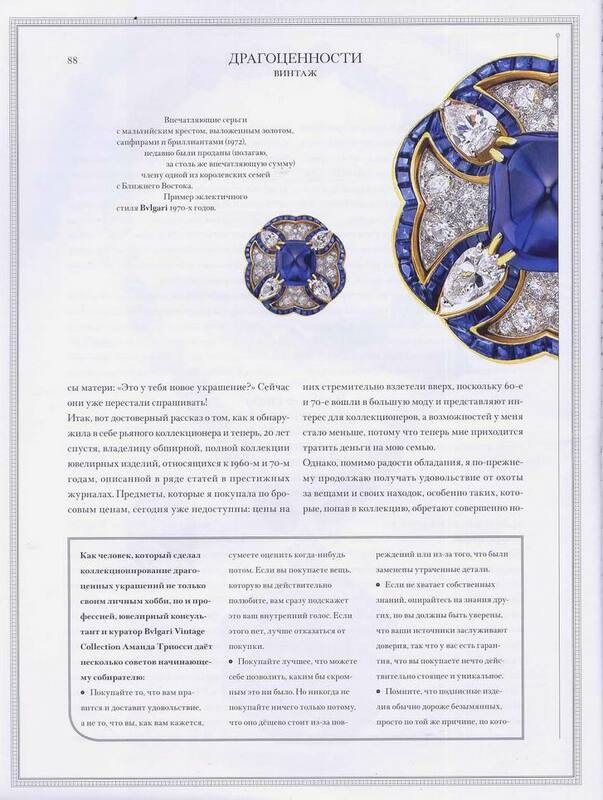 These pages recorded a host of Orientally styled magnificent and eye-catching items - gem-studded crowns, carriages, a throne and Farah Diba wearing extraordinary jewels. 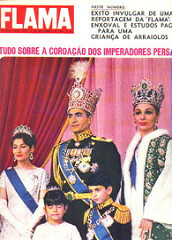 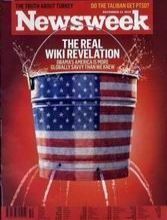 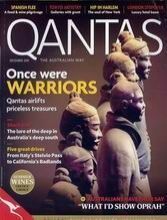 I spent hours leafing through this magazine rather than more traditional children's books. 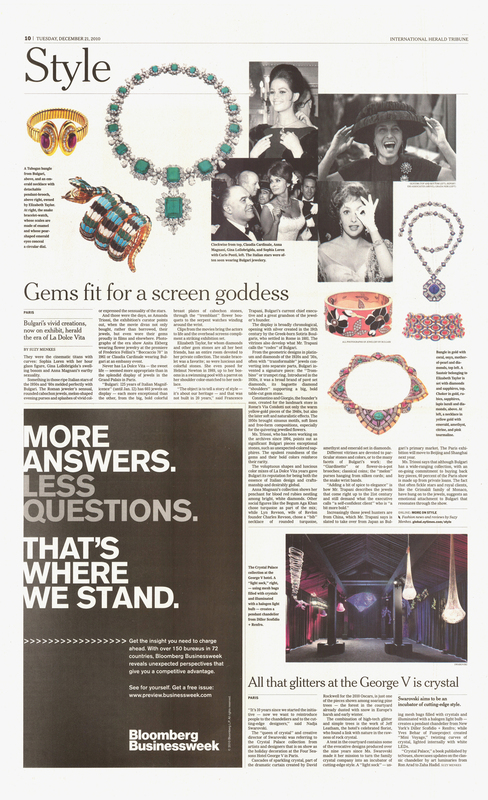 Clearly this glittering and gem-studded event struck my childish imagination and from then on I decided I would devote my life to jewels. 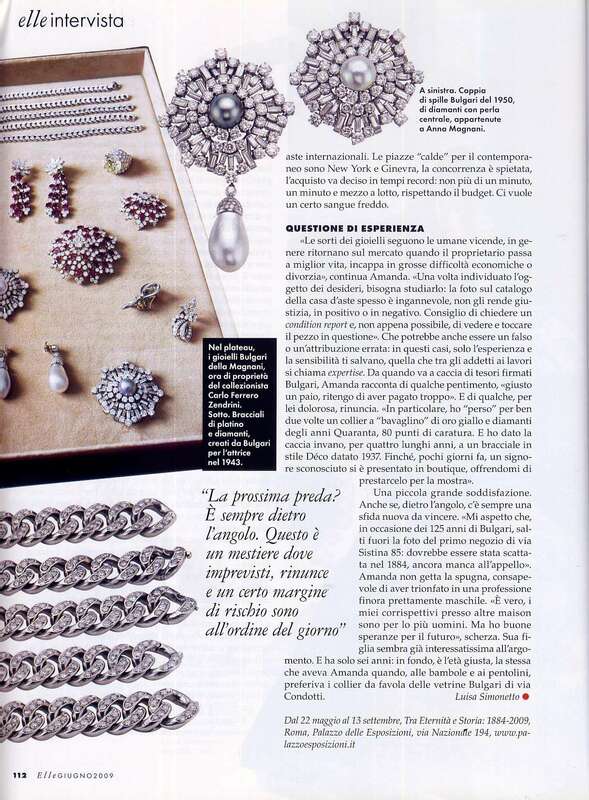 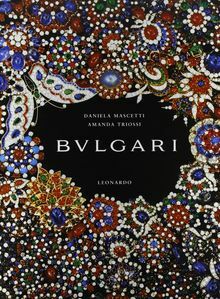 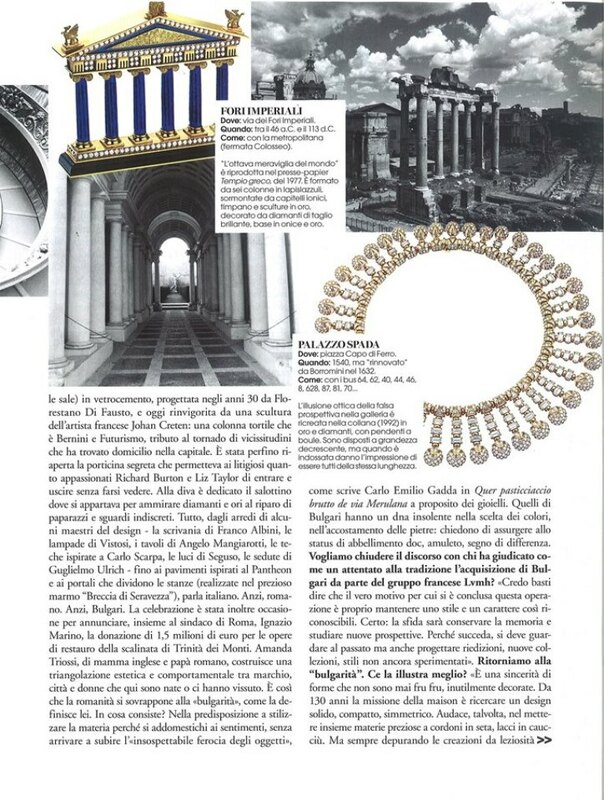 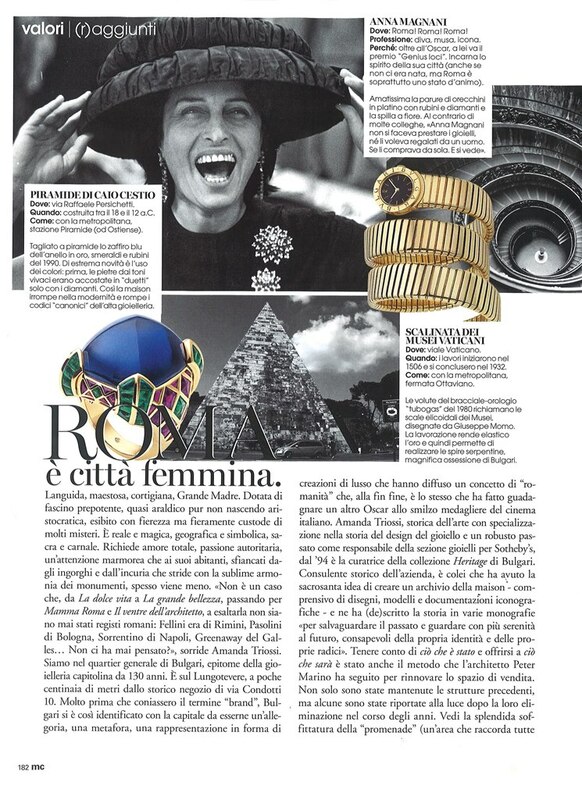 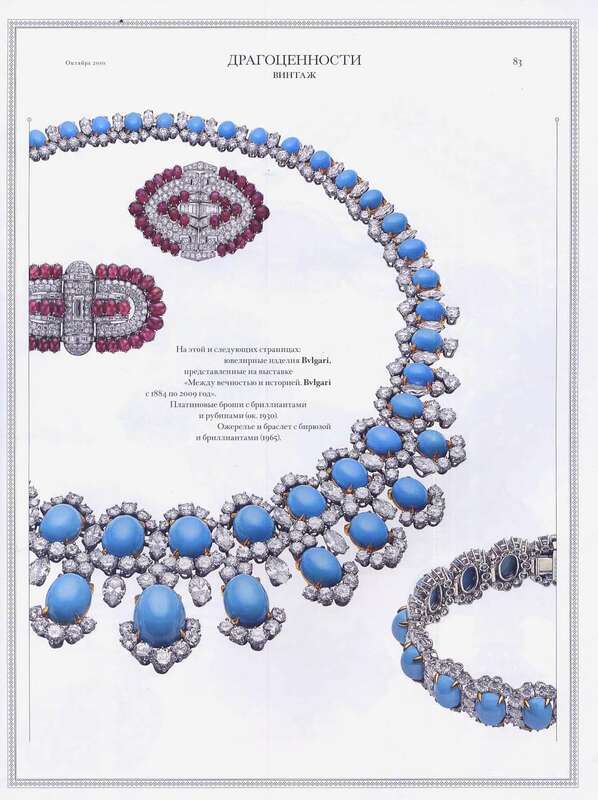 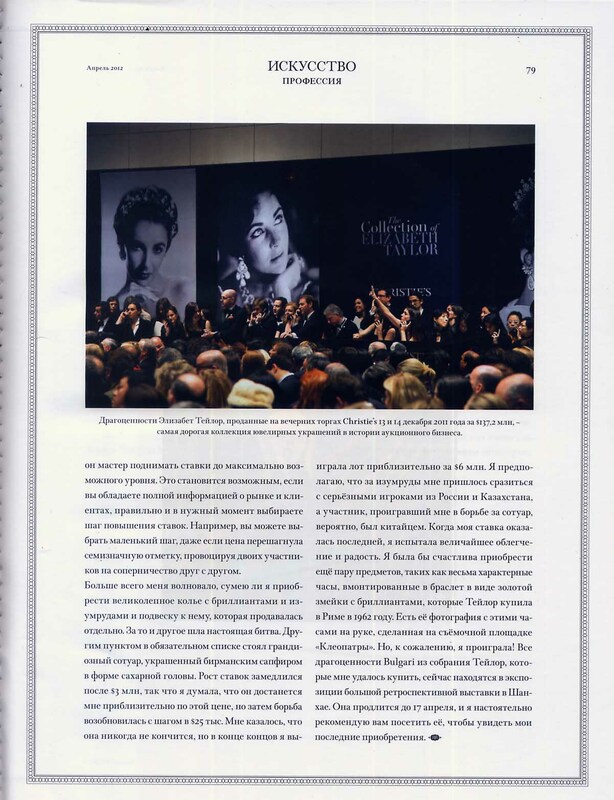 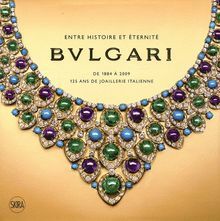 From 1997 to 2015 consultant for Bulgari heading a project for the creation of the Bulgari Corporate Historical Archives in Rome and to develop and increase the Bulgari's retrospective collection. 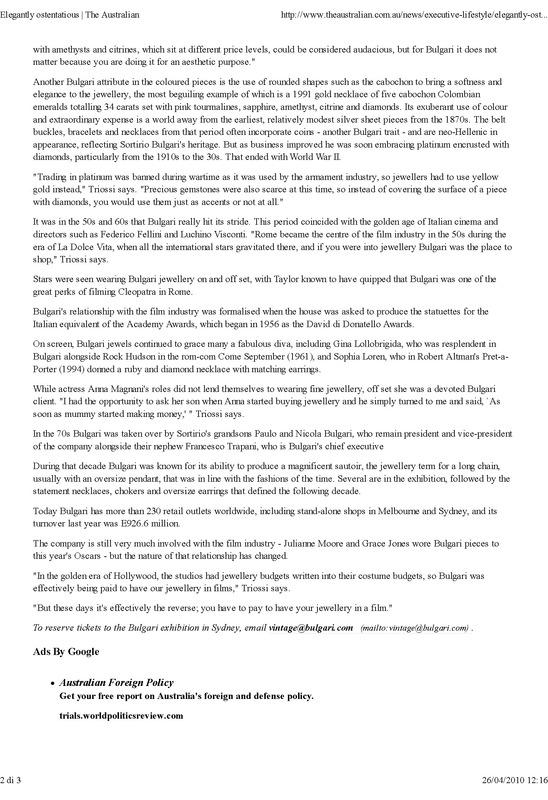 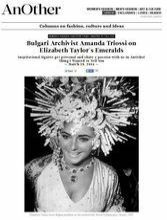 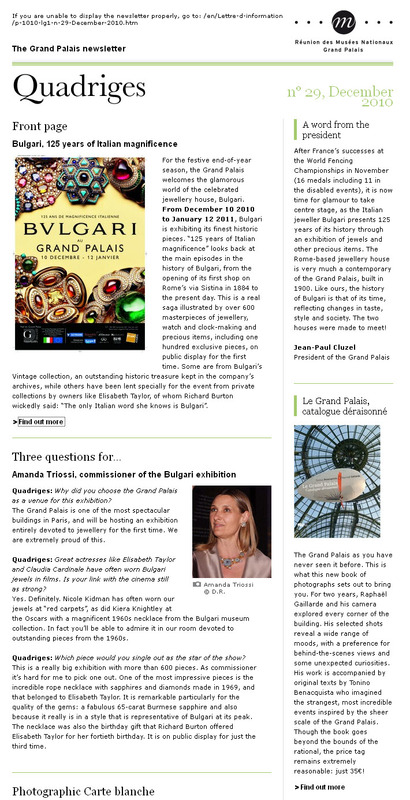 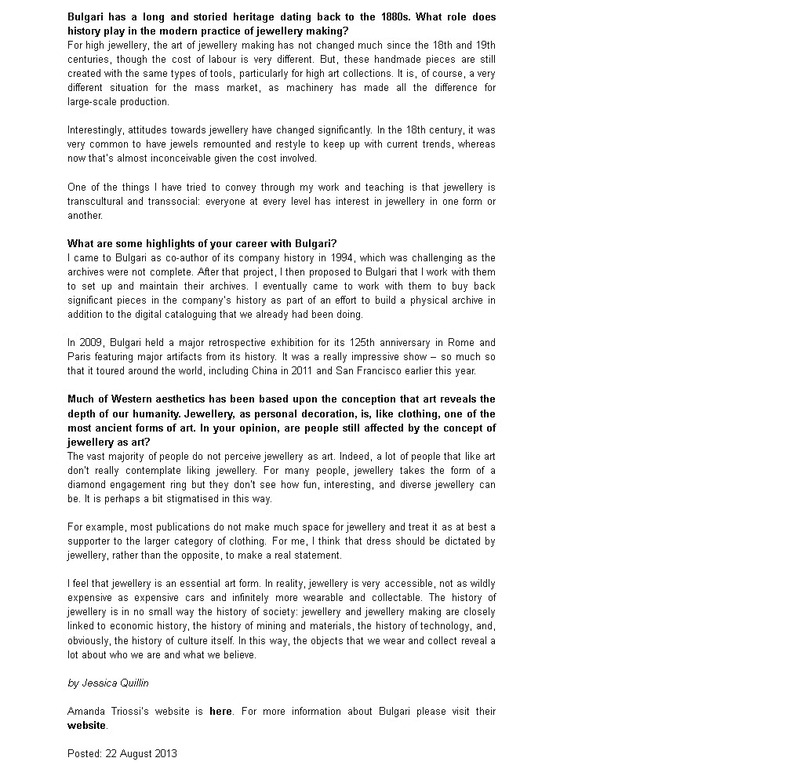 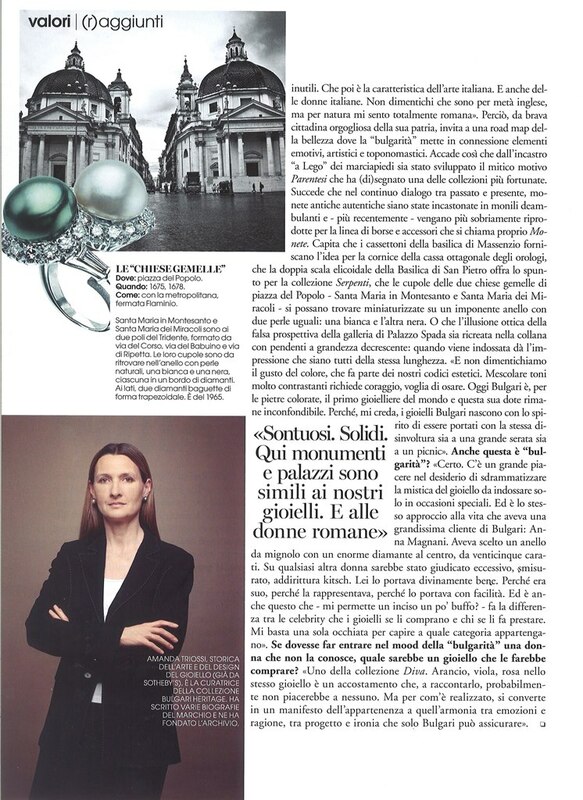 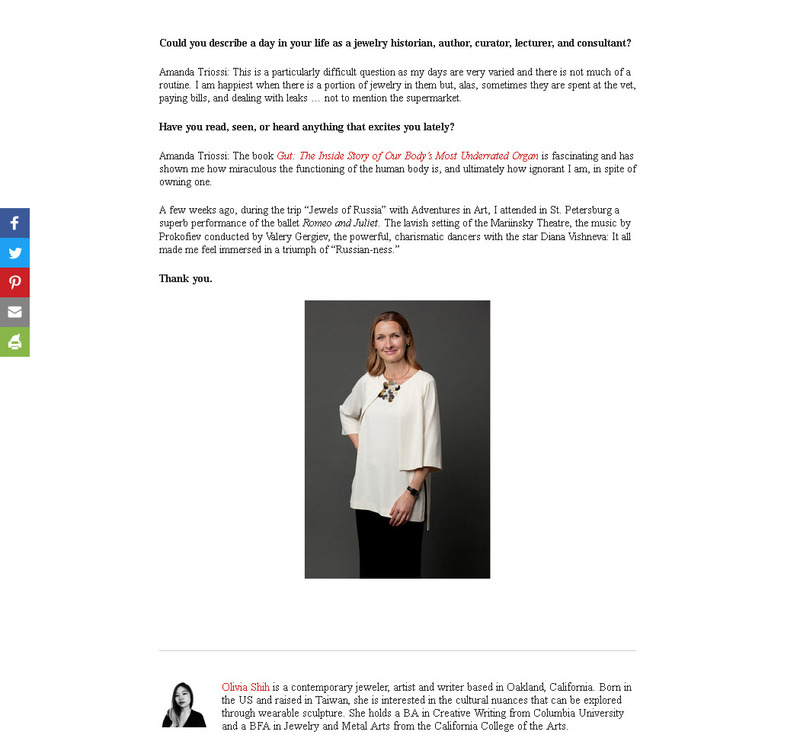 Curator of the first four major Bulgari exhibitions worldwide. 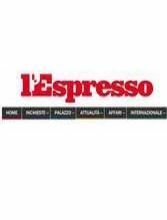 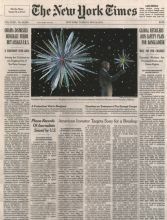 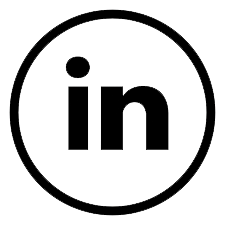 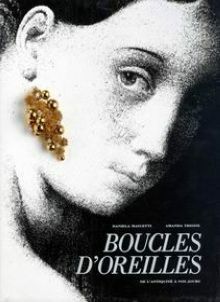 1986 - 2000 Affiliation with Sotheby's, initially at Sotheby's London (1986), Geneva (1987) and Tel Aviv (1988). 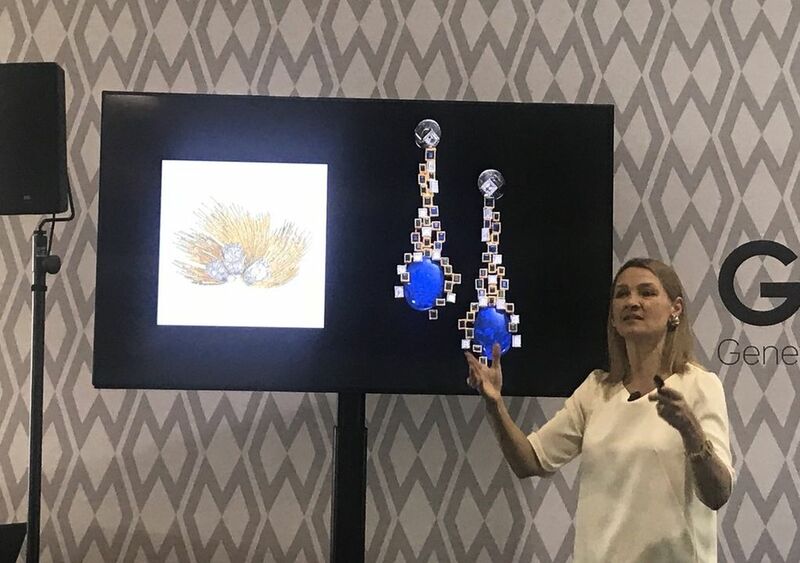 2018 Participated as lecturer at the first edition of Gem Genève, the new international jewellery fair held in Geneva. 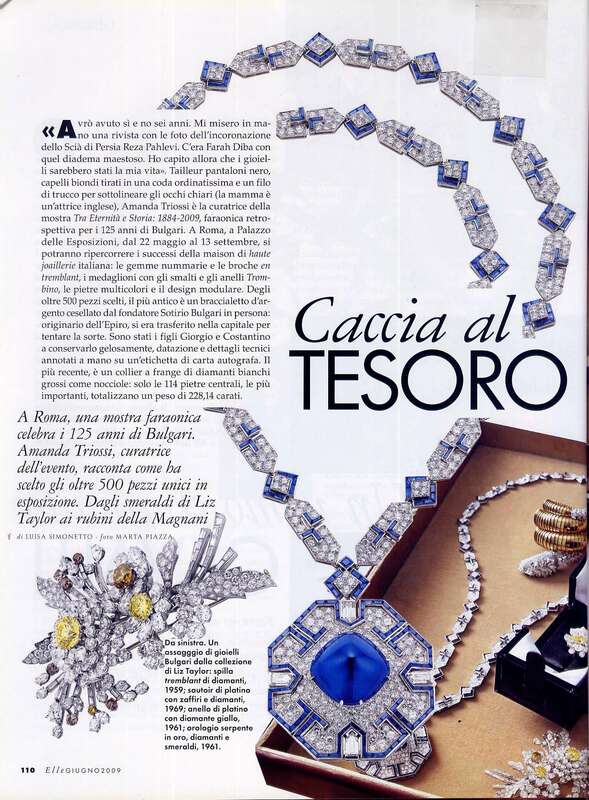 2001 and 2002 Organised, curated and led Jewellery Tour of Rome respectively for the Society of Jewellery Historians (UK) and for Golkonda of Moscow 1992 - 2000 - Organised and held 'Understanding Jewellery with Amanda Triossi' course at Sotheby's Institute in London, the first intensive one-month course entirely devoted to the history of Western jewellery design, offered in London Further seminars and lectures for Sotheby's worldwide as well as other institutions or companies. 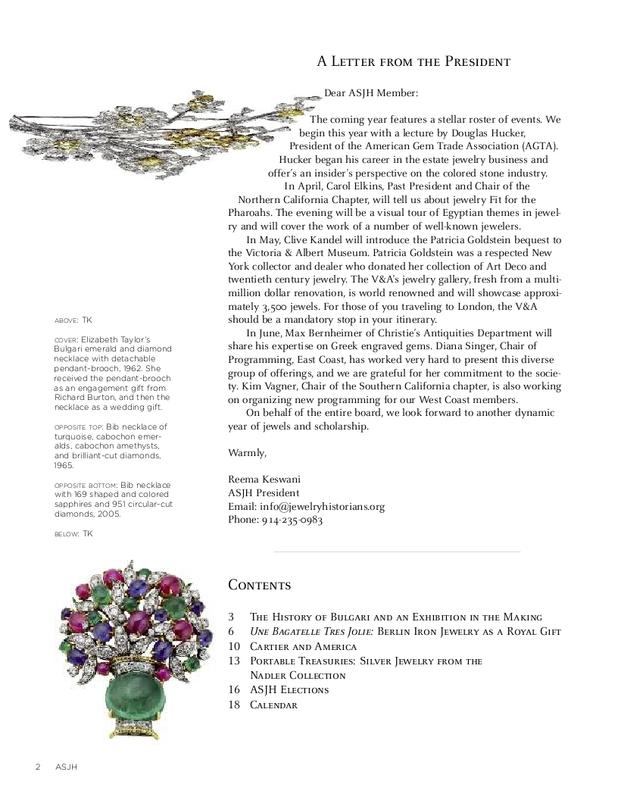 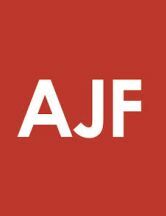 Join me for a series of lectures including a "JAR: a Master Jeweler "; "The Jeweler's Art of the 1960s and 70s and a preview of a fine American collection that will be exhibited at the Cincinnati Museum of Fine Arts". 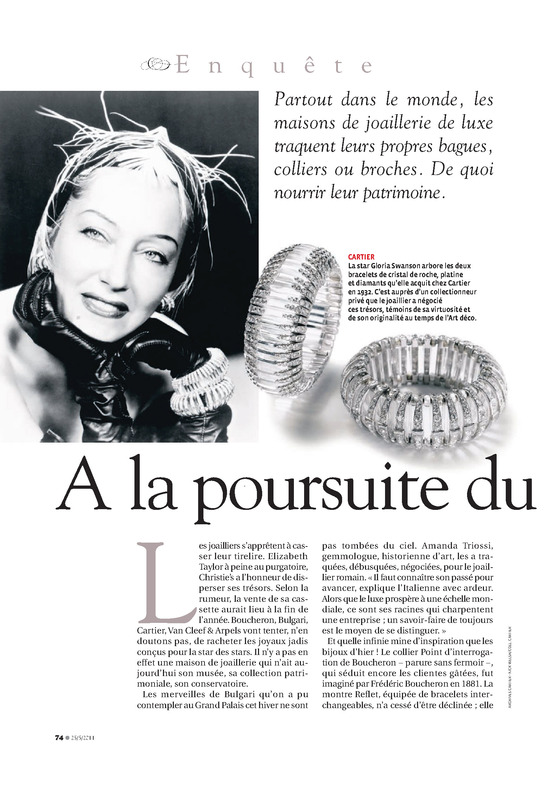 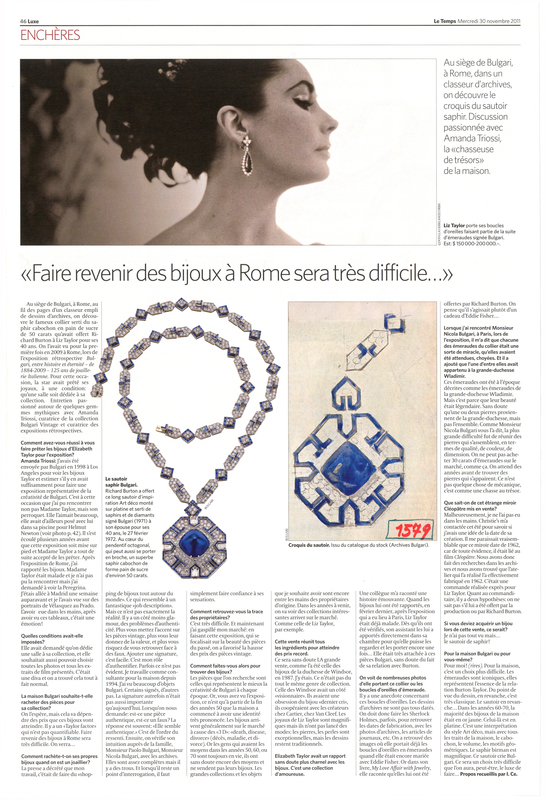 Join me at Gem Genève for a series of free lectures on the History of Jewellery Design. 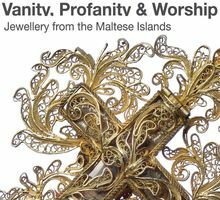 Join me during the course for lectures on the history of jewellery design including important brands, independent designers and visits to jewellery collections. 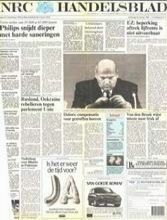 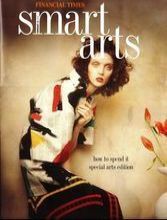 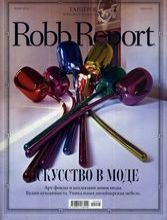 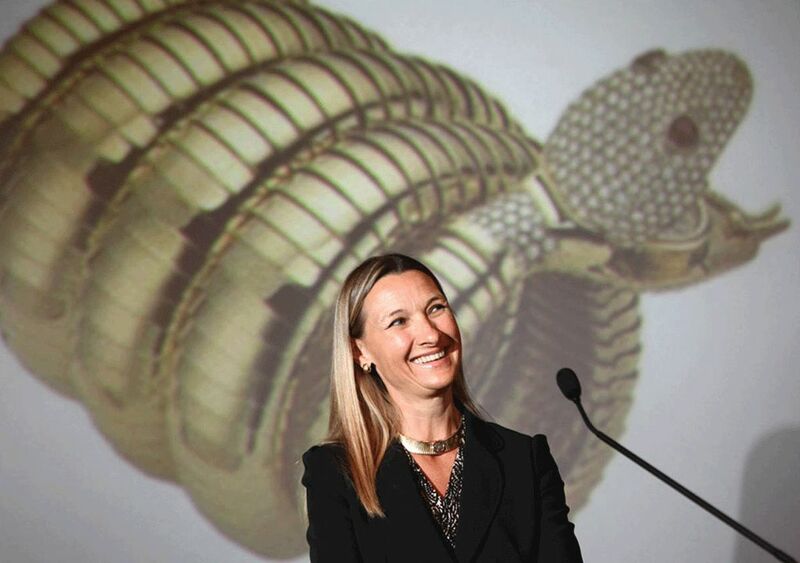 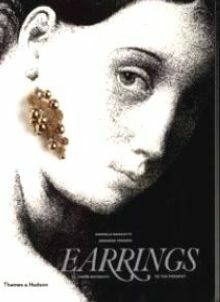 Join me for a series of lectures including a "History of Earrings" ; "Bulgari", "Snakes or Fakes". 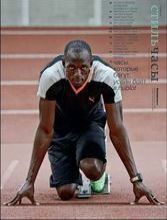 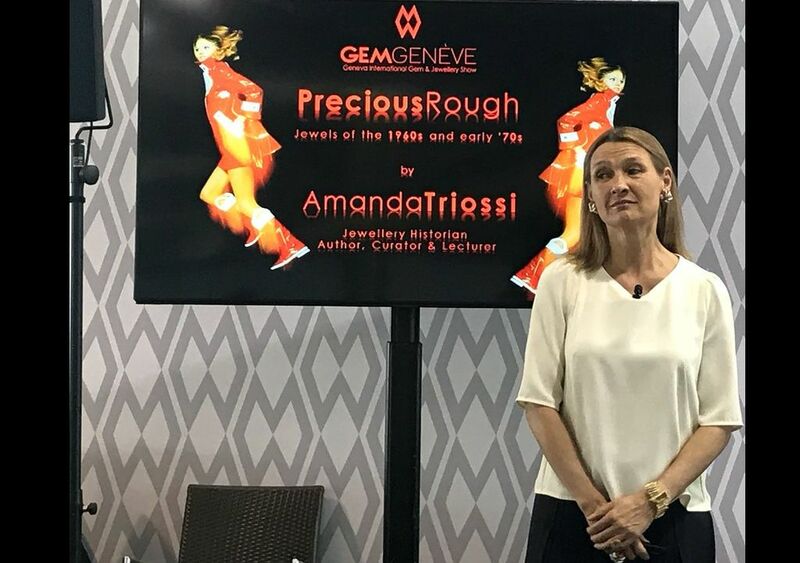 Join me at Gem Genève for a lecture entitled:"Precious Rough".for more information contact: events@gemgeneve.com Gem Genève website: www.gemgeneve.com. 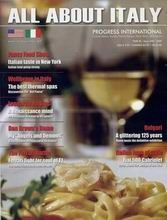 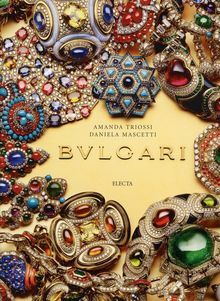 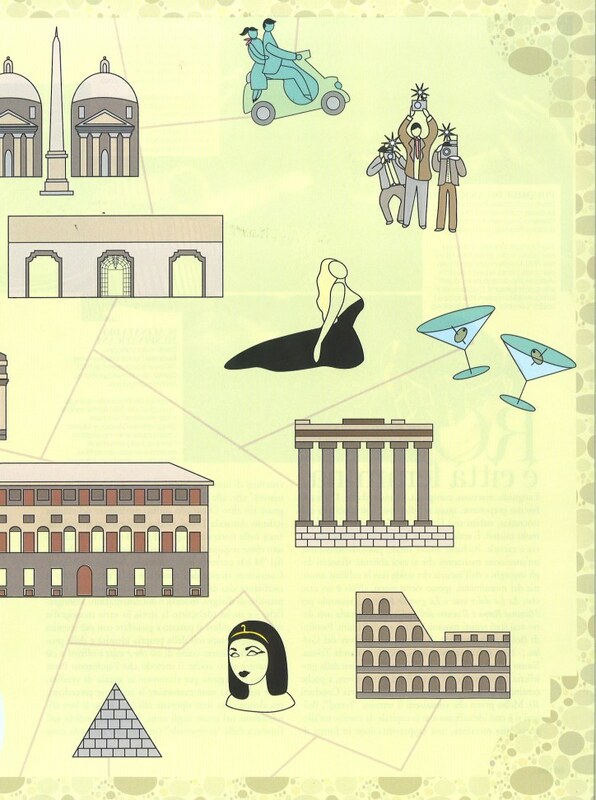 Join me for 'Jewels of Milan: Italian style jewels. 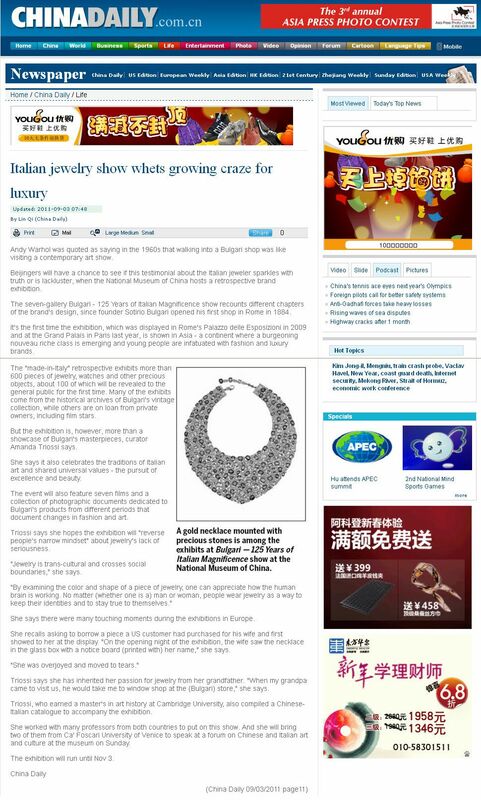 A trip curated for Adventures in Art to further knowledge, understanding and enjoyment of Italian design jewellery. 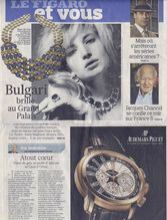 Full day seminar and lecture in Geneva for the International Master on Luxury Marketing at CREA. 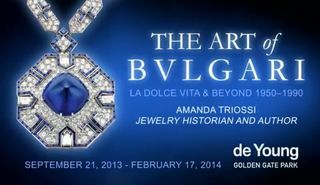 Join me for a dazzling day of jewellery with Adventures in Art. 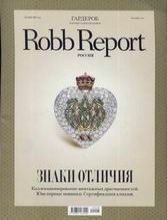 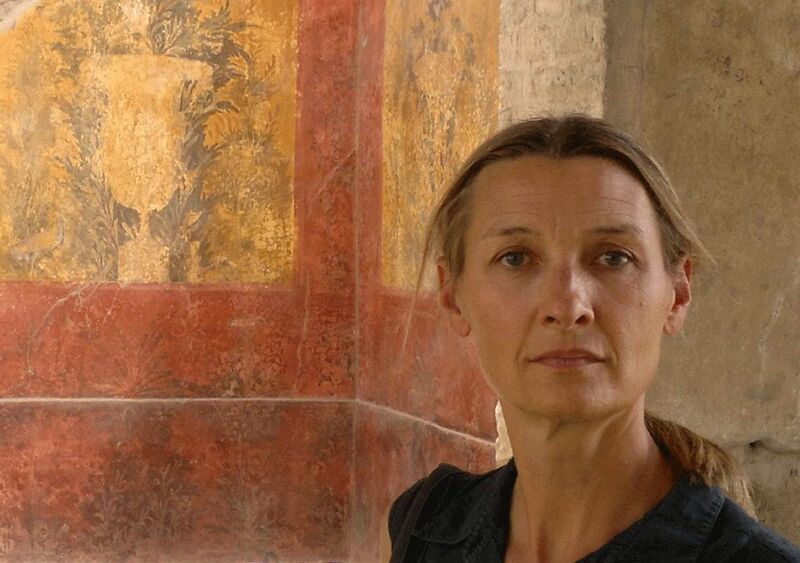 Join me for 'Jewels of Russia' Moscow & St. Petersburg with Adventures in Art. 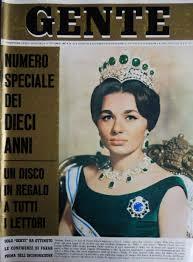 Via S. Eligio, 7, Rome. 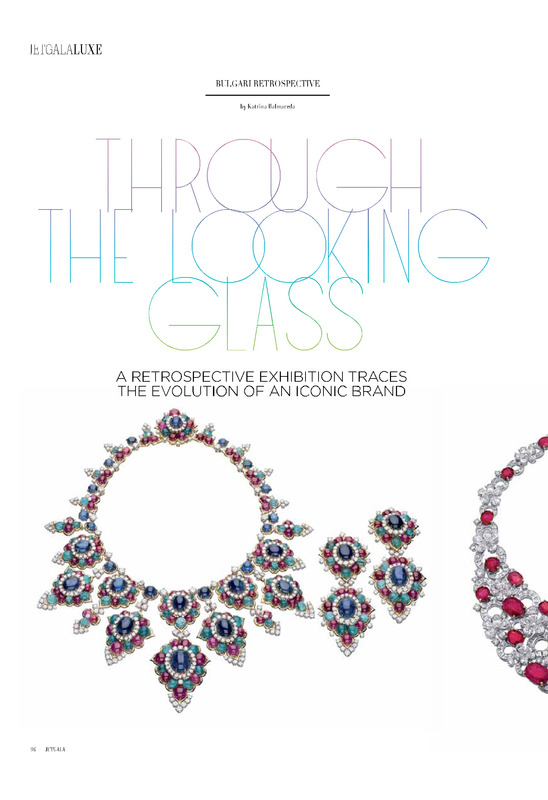 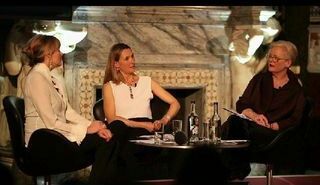 Lecture '20th Century High Jewellery: a story of extraordinary variety'. for an insider's Rome Jewellery trip "From Etruscan gold to Bulgari gems"
Lecture "Bulgari storia di uno stile prezioso dal 1884 ad oggi"
Made in Italy: re-use of fashion heritage and new digital perspectives. 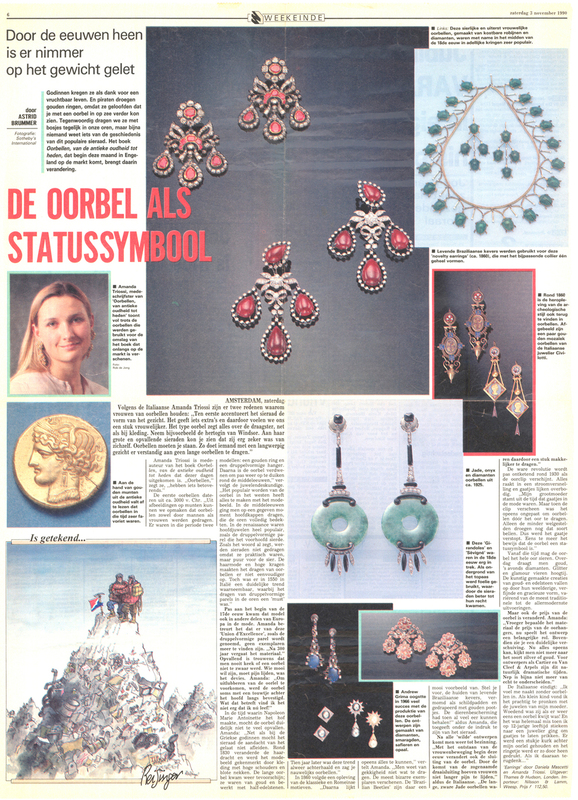 Lecture "20th Century Jewelry Design and JAR"
coinciding with the opening of the Exhibition "Jewels by JAR" on view until March 9th 2014. 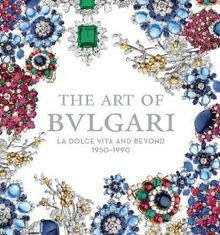 Lecture " The Art of Bulgari from the Dolce Vita and beyond" coinciding with the opening of the Exhibition "The Art of Bulgari" on view until February 17th 2014. 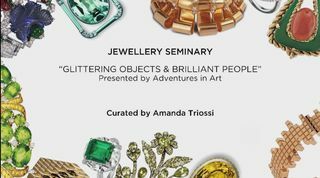 Lecture and Conversation "Is Jewellery Art?" 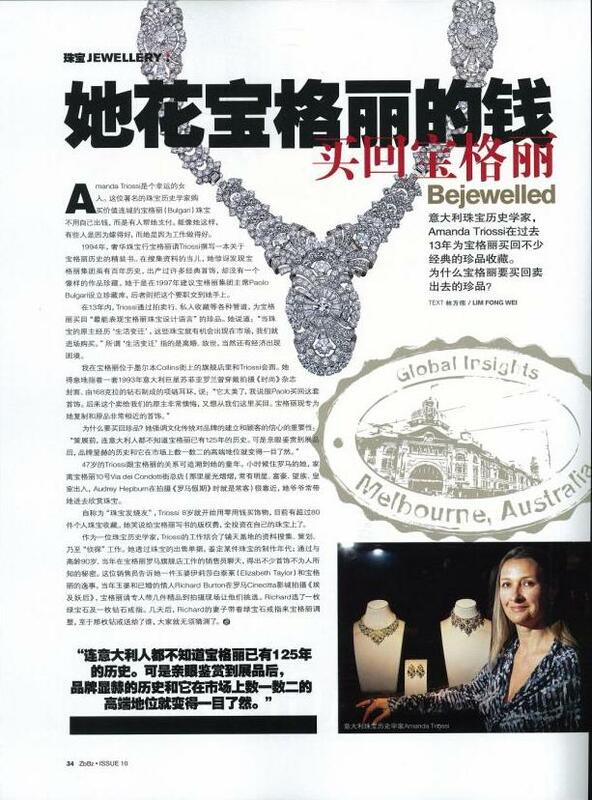 with Edwina McCann, Editor in Chief Vogue Australia. 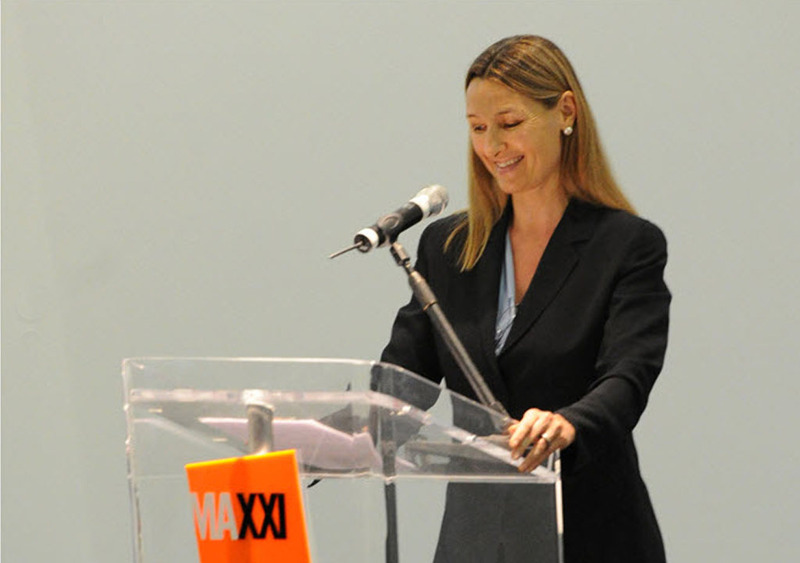 Moderator Julie Ann Morrison, MD Bulgari Australi & UK. 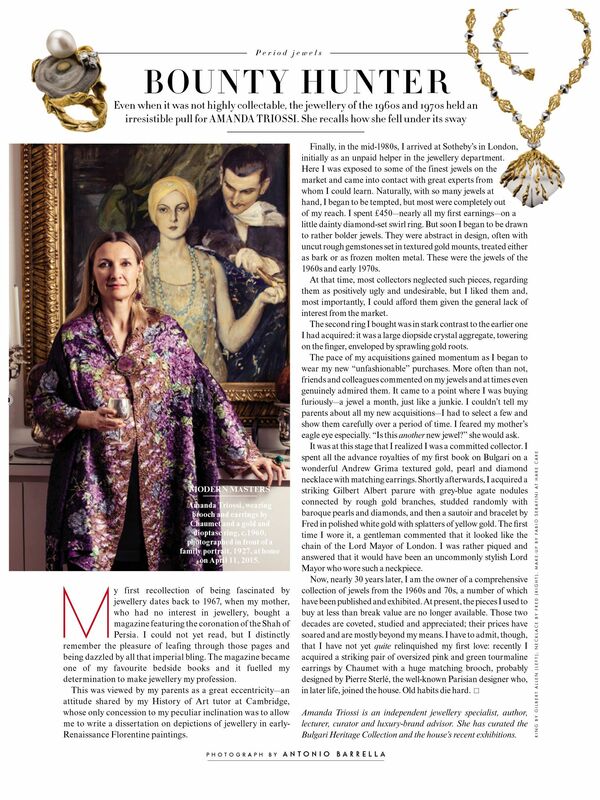 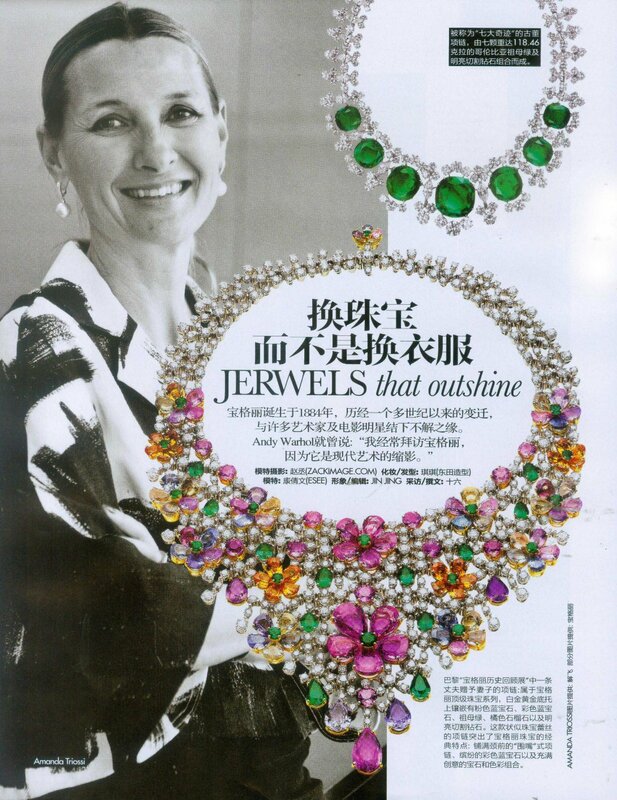 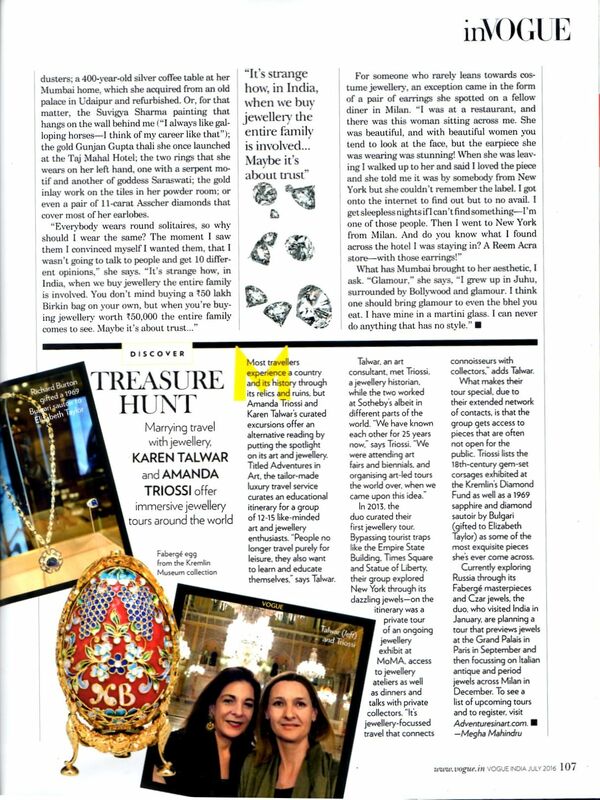 with Carol Woolton Jewellery Editor Vogue UK. 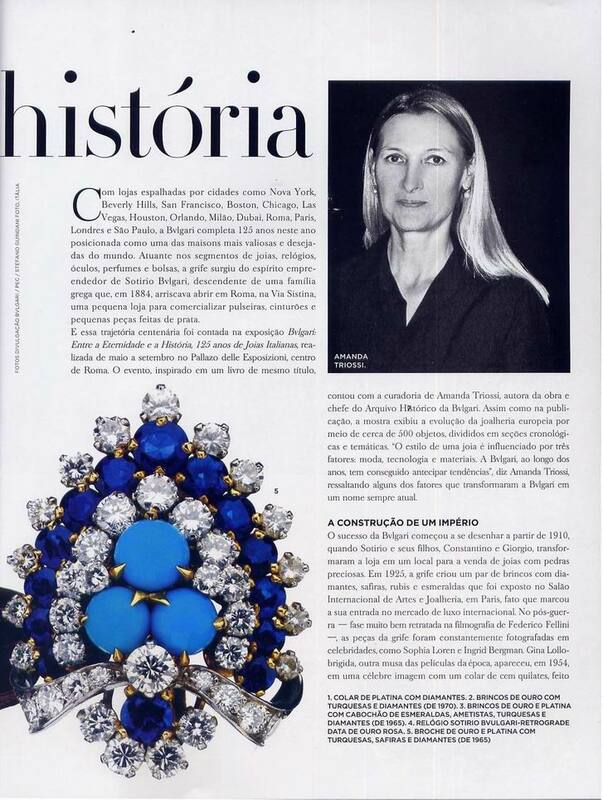 125 anni di gioielli italiani"
"125 ans de magnificence italienne"
"La Dolce Vita and Beyond 1950-1990"